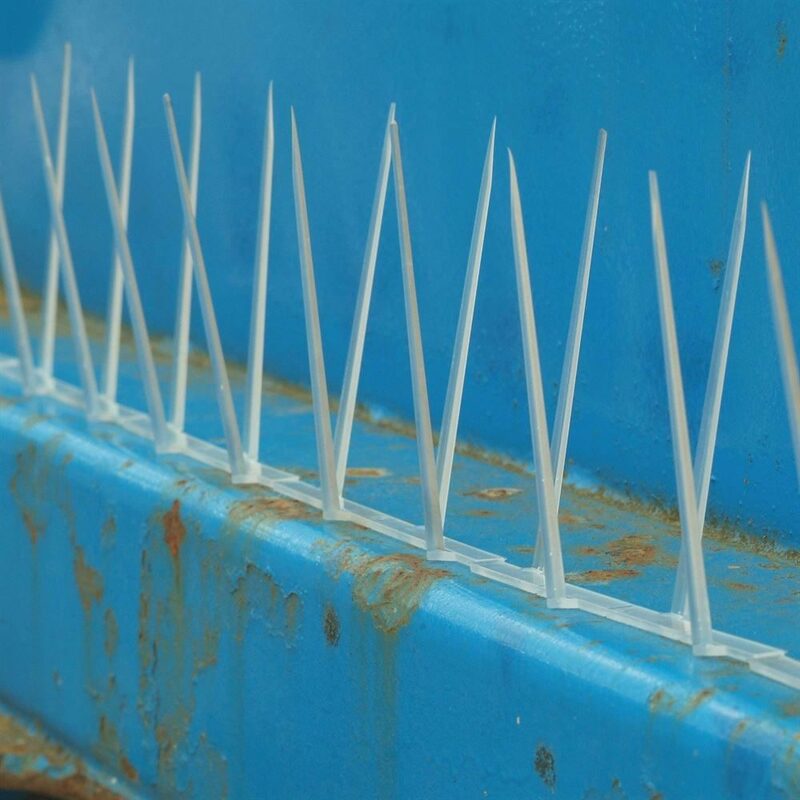 The Defender® 8 Plastic Pigeon Spike is suitable for protecting wide ledges of up to 20 cm (8 inches). 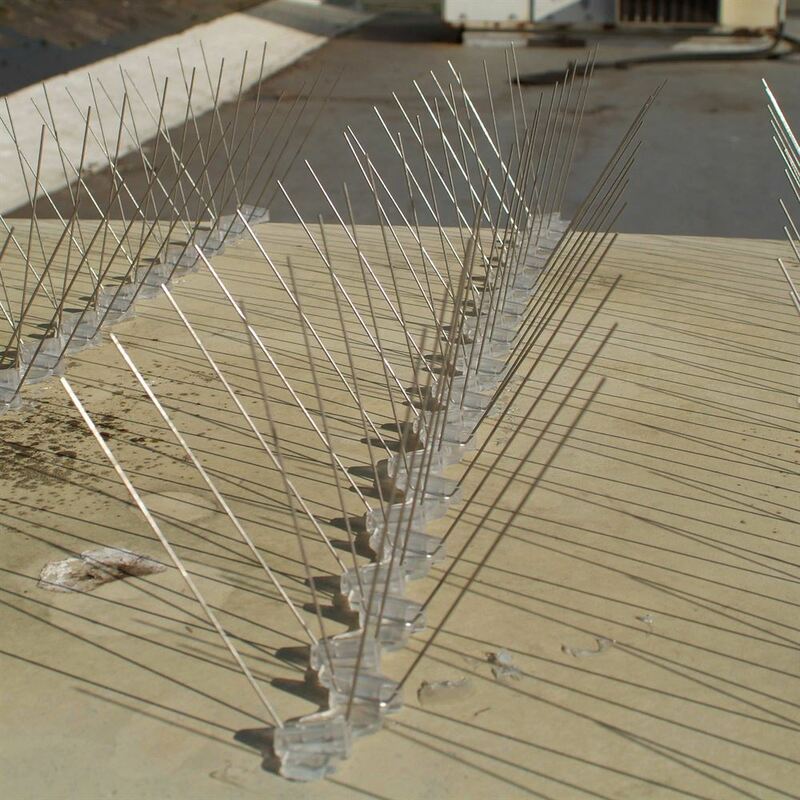 This humane bird control spike has 20 protruding pins that, when installed, stop birds from landing when installed on ledges, beams or fences. The pins simply make it uncomfortable for the bird or pigeon to roost, deterring the birds from landing. They will then move on to an easier nesting or roosting site. 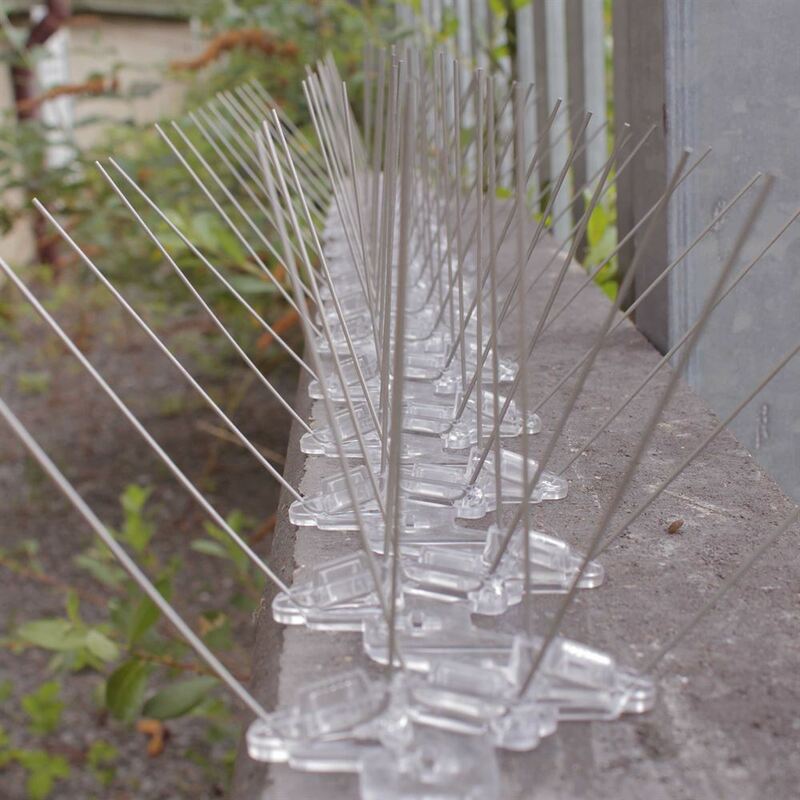 Get rid of birds from your property quickly with the Defender® 8 Wide Plastic Pigeon Spike. The Defender® 8 Stainless Steel Bird Spike is a super tough bird deterrent spike suitable for wide ledges of up to 20 cm or 8 inches. 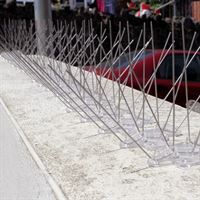 This anti-pigeon spike will get rid of birds even if the ledge is heavily infested. 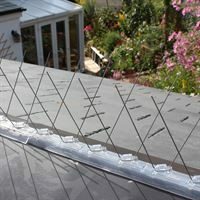 UK manufactured Defender® Stainless Steel Bird Spikes come with a 25 Year "No Rust" Warranty - giving you a quality product that you can rely on. All our pigeon spikes are humane. 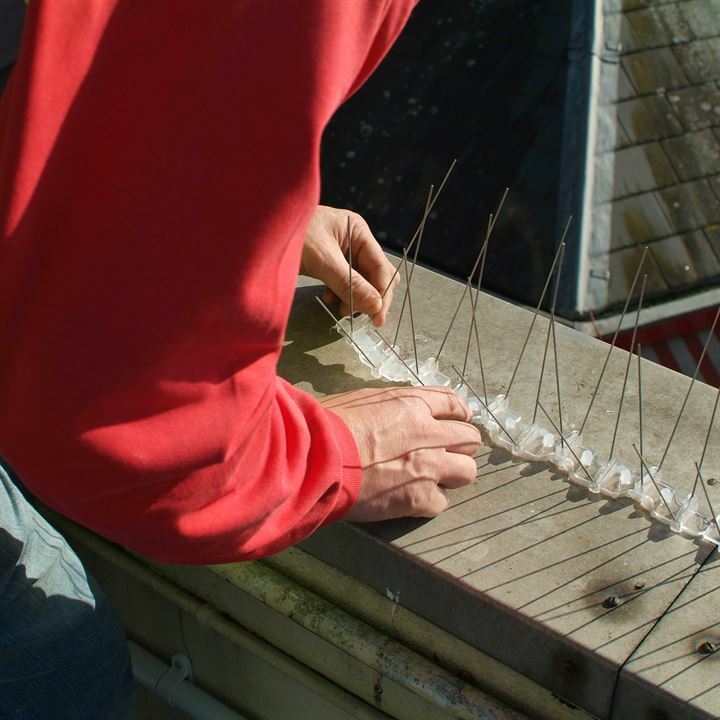 They simply make it uncomfortable for the bird to land, causing it to move on to an easier roosting or nesting site. 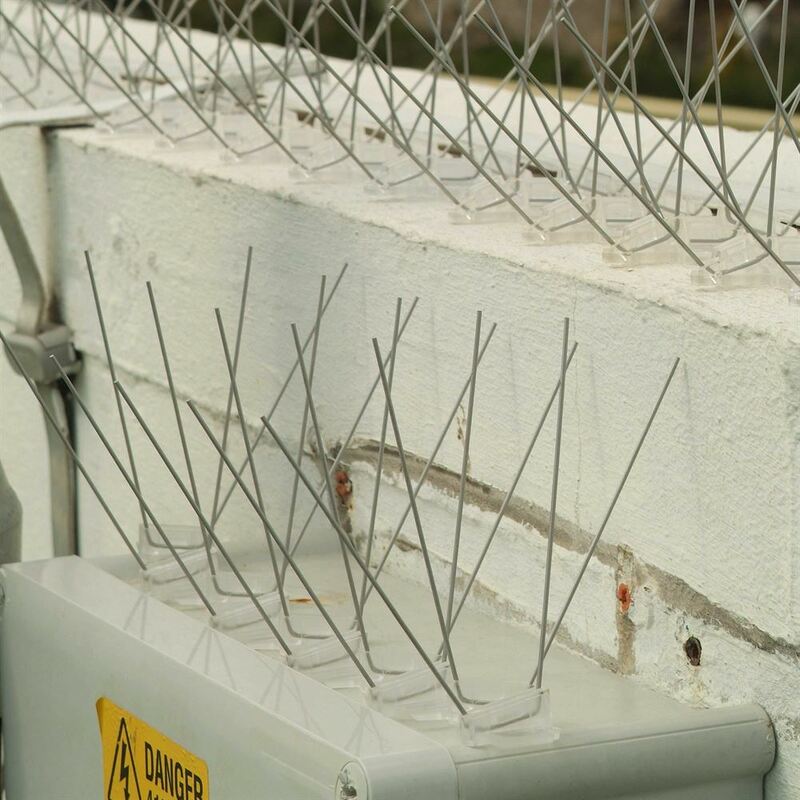 Take a look at the Defender® 8 Steel Bird Spike installed on signs, roofs and even air conditioning units! Don't underestimate the strength of the Defender® 4 Plastic Pigeon Prevention Spike - it’s small but mighty and gets rid of pigeons quickly. 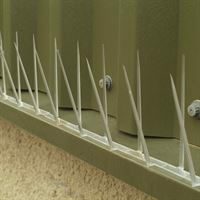 As can be seen from the installation photos, the Defender®4 Plastic Pigeon Prevention Spike has been designed to suit narrow ledges. 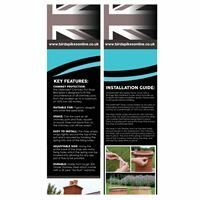 It can be used on sheds, walls, fences, pipes, window sills and any surface that is less than 10 cm or 4 inches wide. 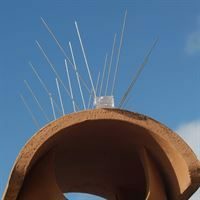 This pigeon prevention spike will even protect heavily infested areas - just make sure the ledge is clean and dry before installing it. 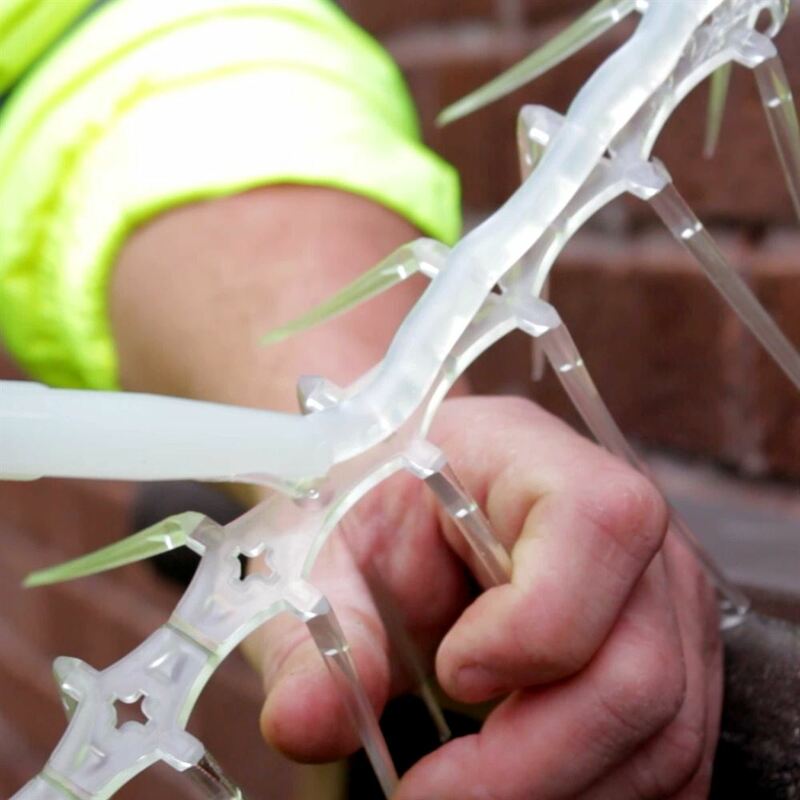 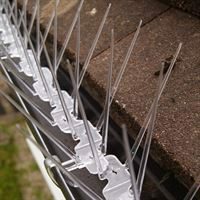 The Defender® 4 Plastic Pigeon Spike is manufactured in the UK and has a 15-Year Warranty - giving you a high quality installation to get rid of your bird problem. 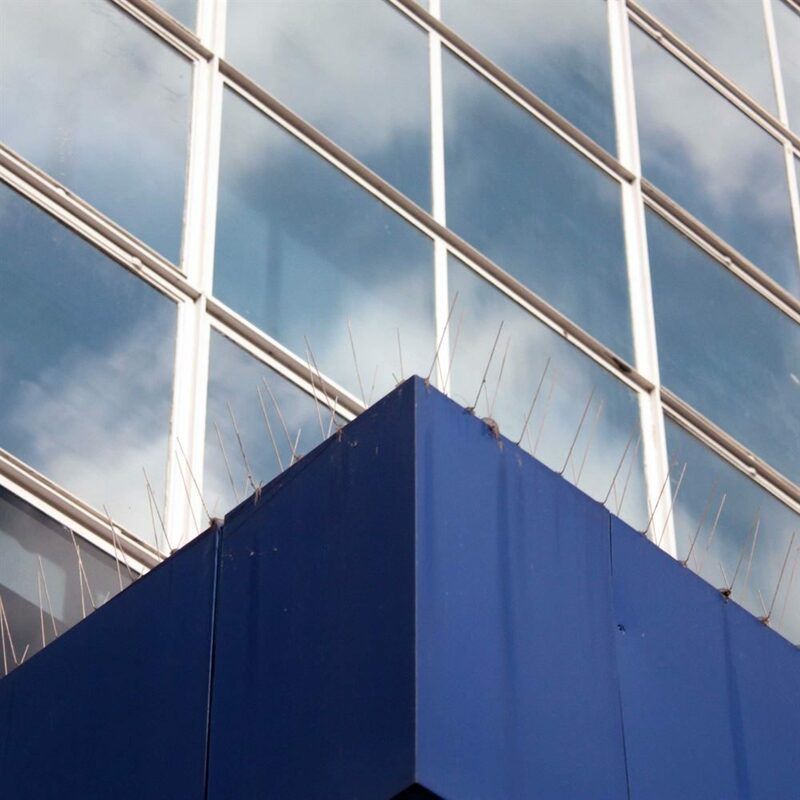 The Defender® 12 Extra Wide Steel Spike is for use on those large areas where birds and pigeons are keen to nest and roost on! 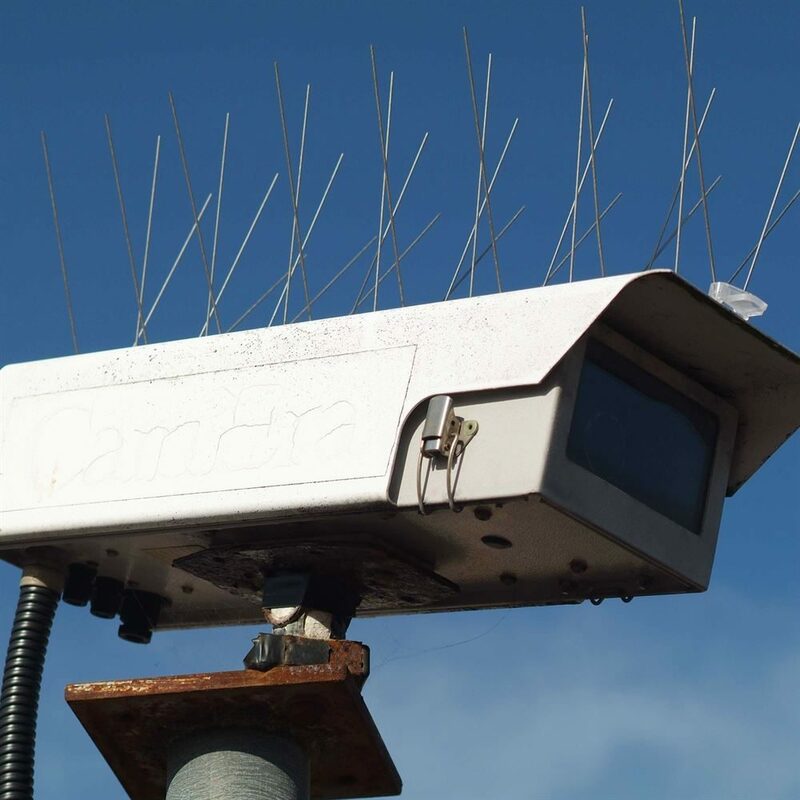 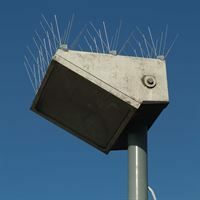 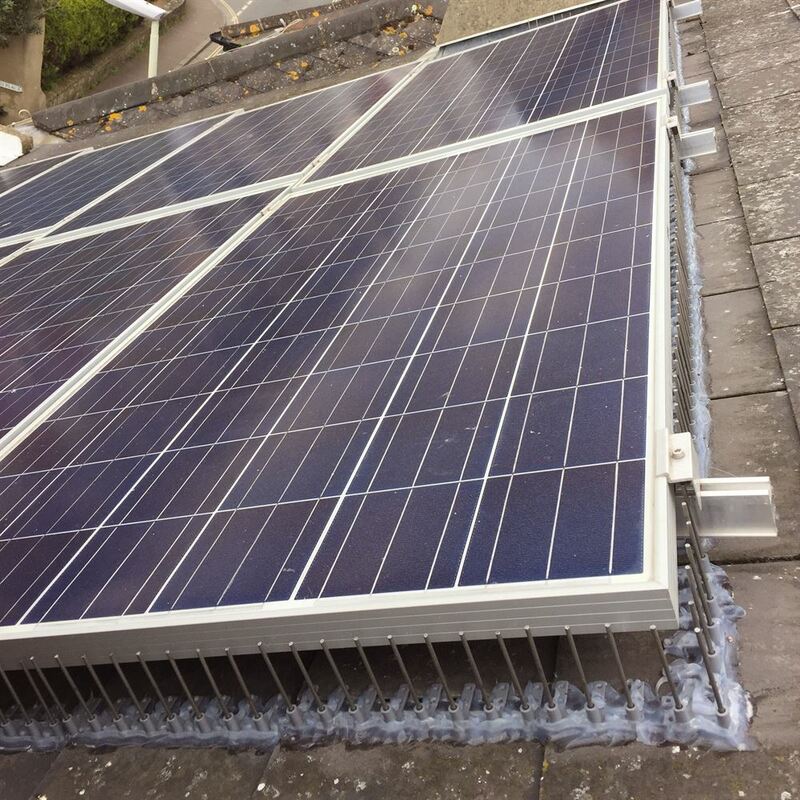 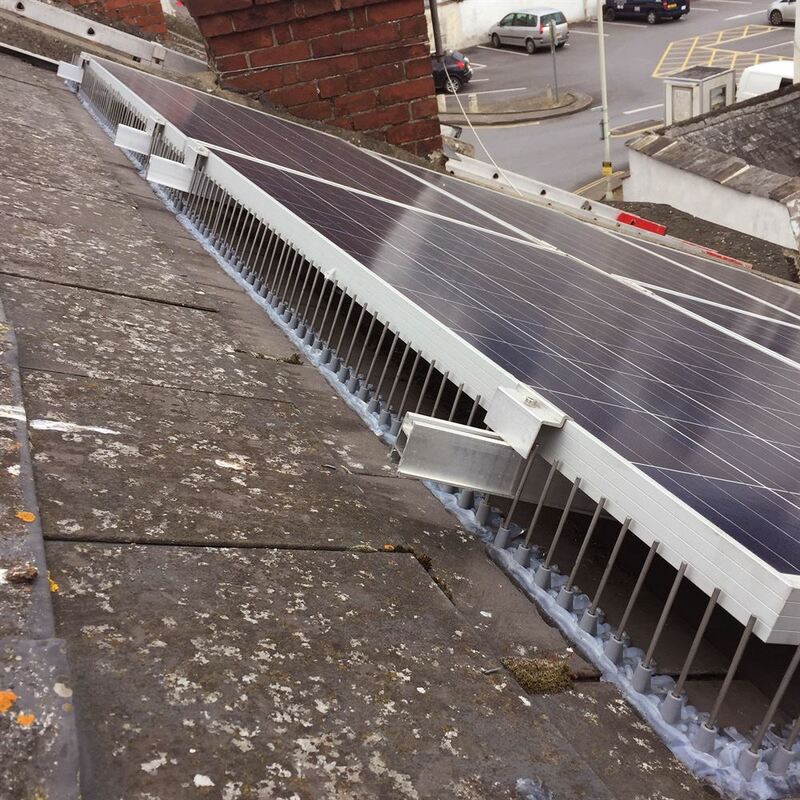 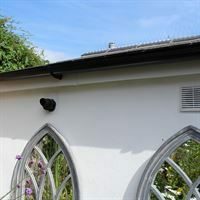 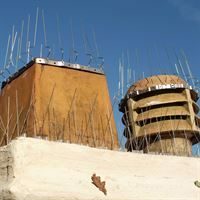 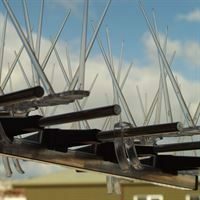 Take a look at photos of the widest spike available on the market, installed, which confidently stops pigeons and birds from landing on a ledge of up to 30 cm or 12 inches wide. 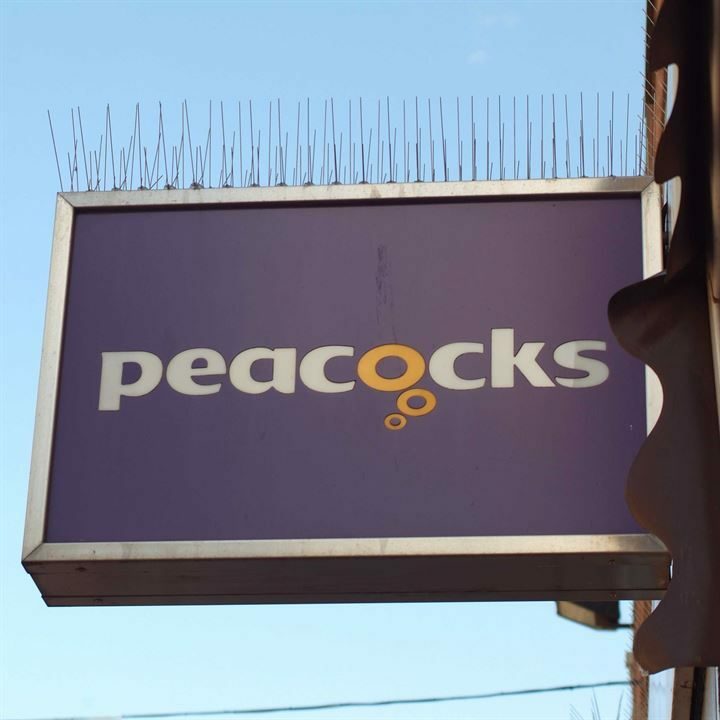 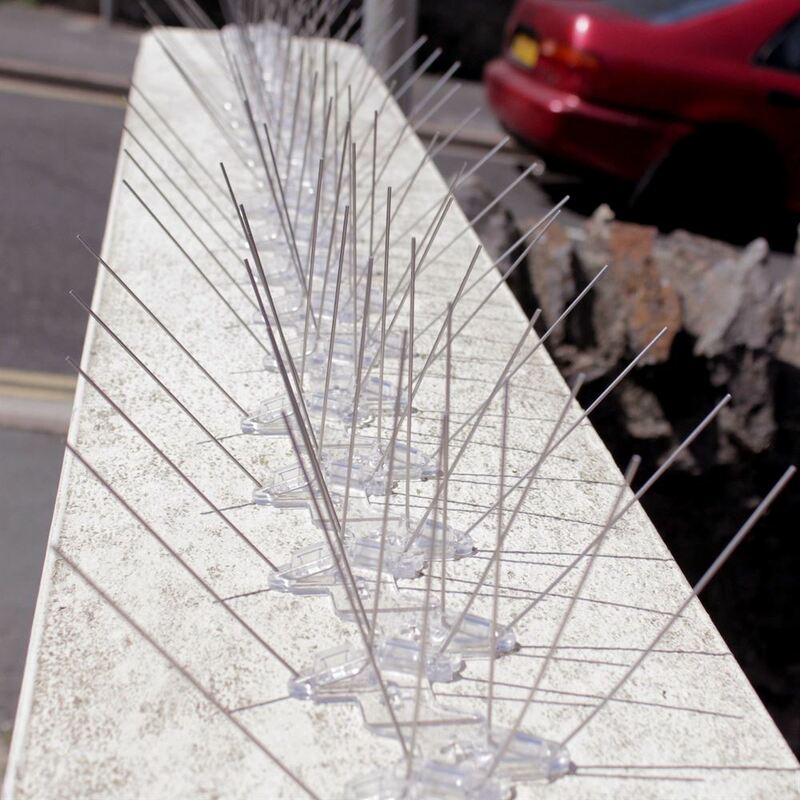 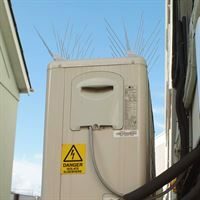 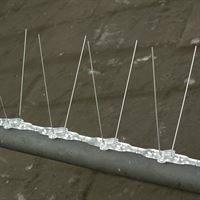 Stainless Steel Pigeon Prevention Spikes are thought to be slightly less visible once installed, so if you are looking for a discreet bird control system, stainless steel bird and pigeon spikes could be the answer. 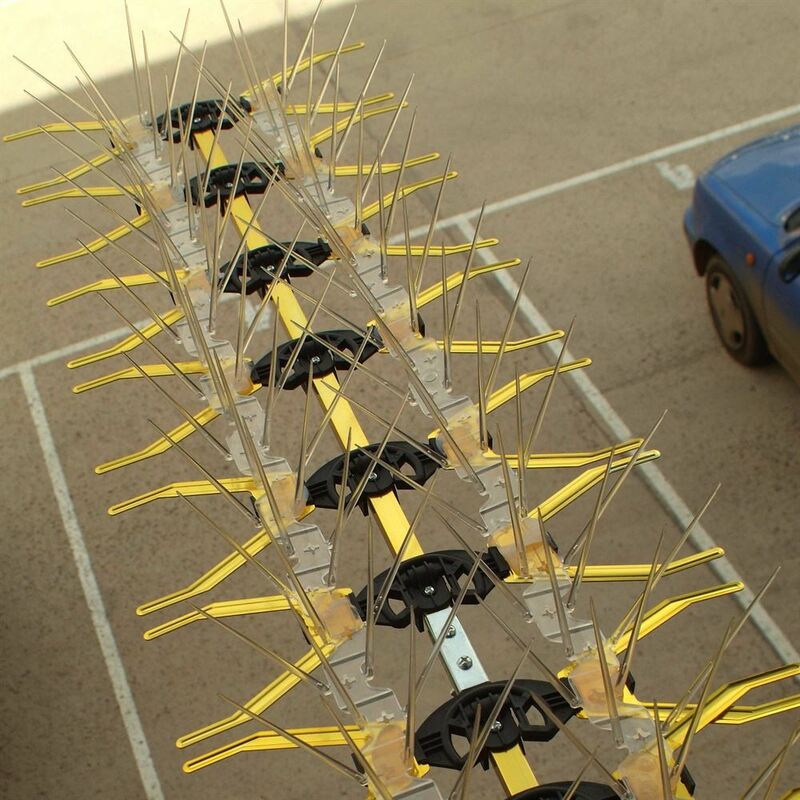 This bird spike is made in the UK and includes a 25-Year "No Rust" Warranty. 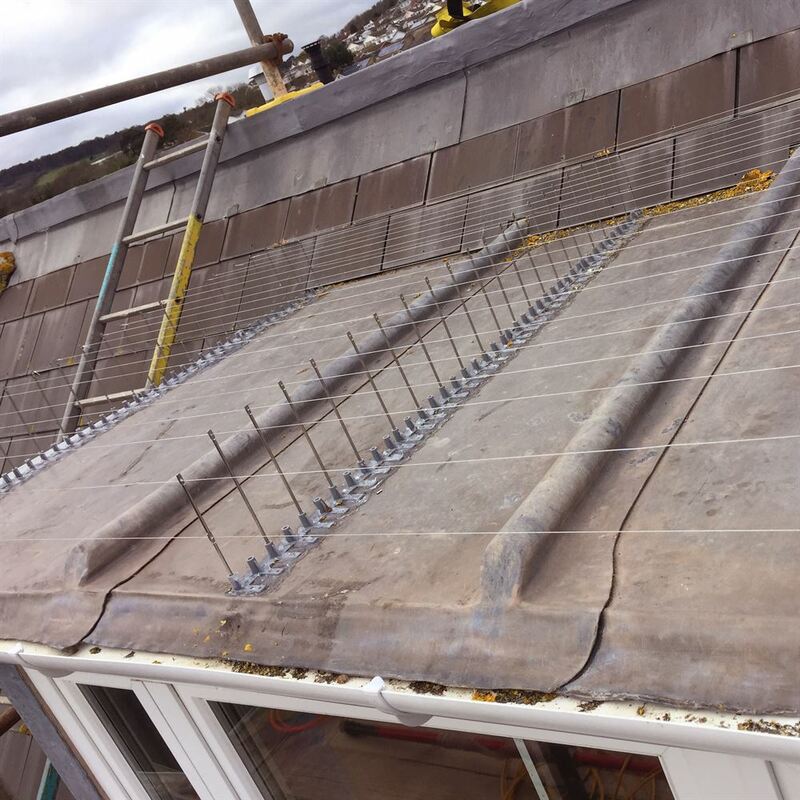 The Defender® Seagull Spikes have longer pins to help prevent seagulls from landing on ledges of up to 27.5 cm (11 inches) wide. 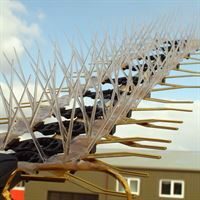 This humane seagull spike has 20 protruding stainless steel pins, each a length of 15 cm (6 inches) in length, offering complete protection from these large seaside birds. 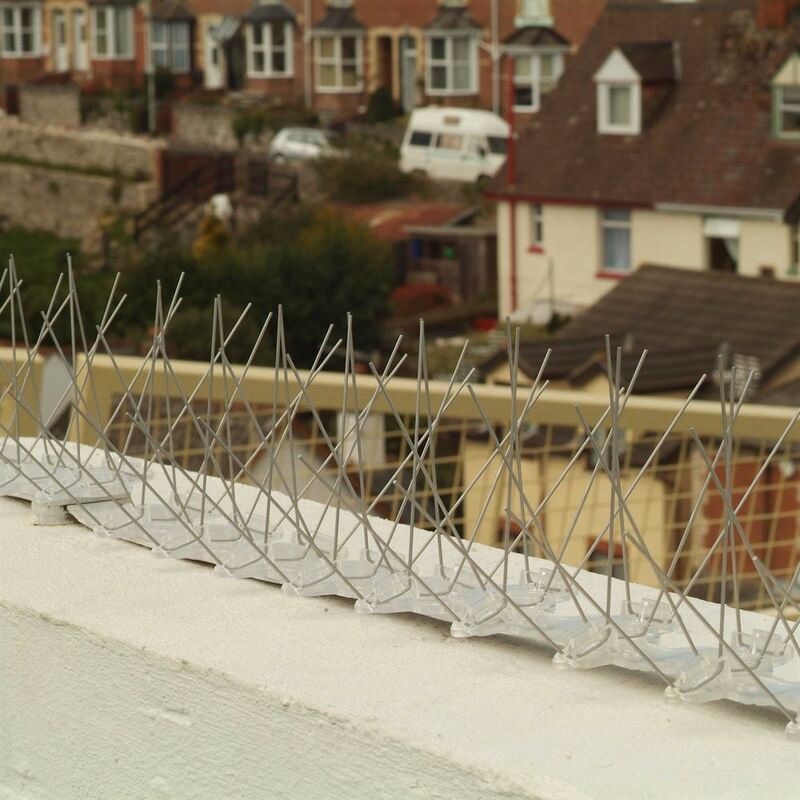 Seagull control and stopping gulls from landing can be a hard task as these birds are strong and persistent, but this durable Defender® Seagull Spike has been manufactured in the UK to a high standard and includes a 25-Year "No Rust" Warranty. This seagull deterrent spike is the only answer to stopping a gull problem. View photos of the Defender® Gull Spikes installed on lamp posts, ledges, roofs and power units. 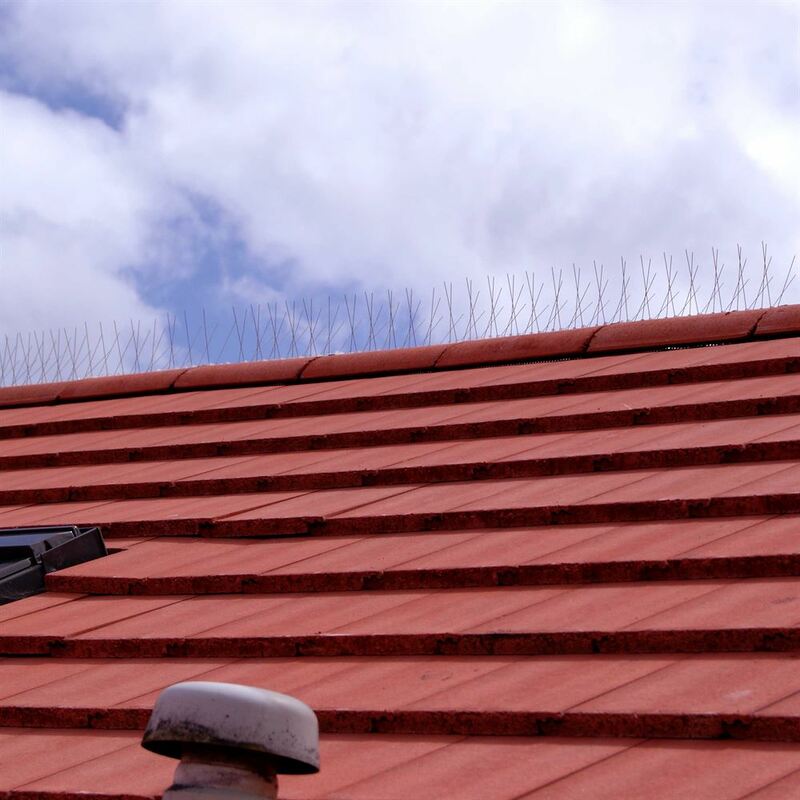 The Defender® Ridge Spike has an angled base, as can be seen from photos of the installed roof spikes. 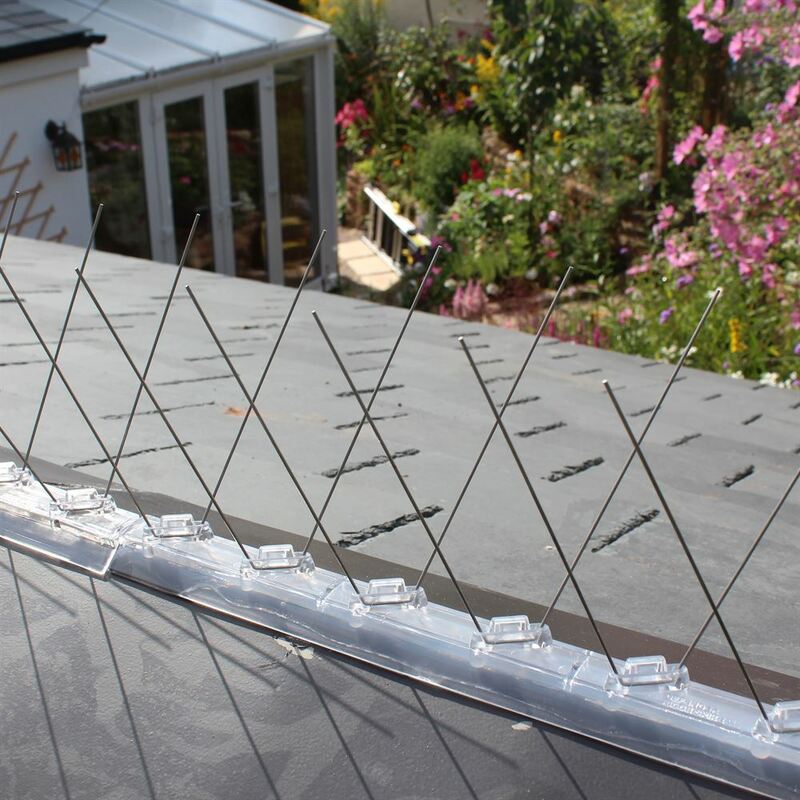 These ridge roof spikes have been specifically designed to attach to roof ridges and roof tiles. 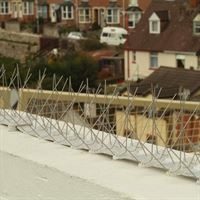 This pigeon and bird deterrent is not only great at getting rid of pigeons but will also get rid of gulls as the pins are an extra long length to match the leg height of the gull. The Defender® Ridge Spike Bird Control Deterrent is made in the UK from the highest quality materials, and even includes a 25-Year "No Rust" Warranty. Get birds off your roof ridge with this simple and effective pigeon spike! 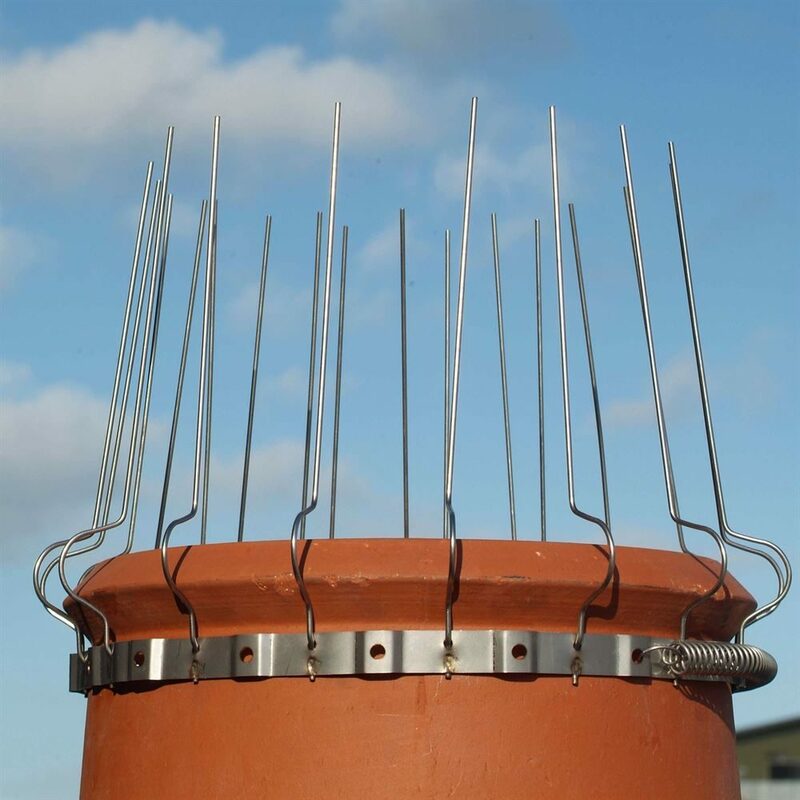 The Defender® Chimney Pot Spikes will keep birds, pigeons and seagulls off your chimney pot or cowl. 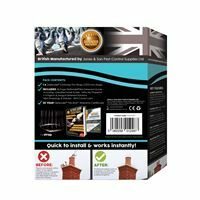 This chimney bird guard is easy to install, as the flexible strap can simply be wrapped around any pot size below 107 cm. It will bend to fit square chimney pots and round cowls as required. 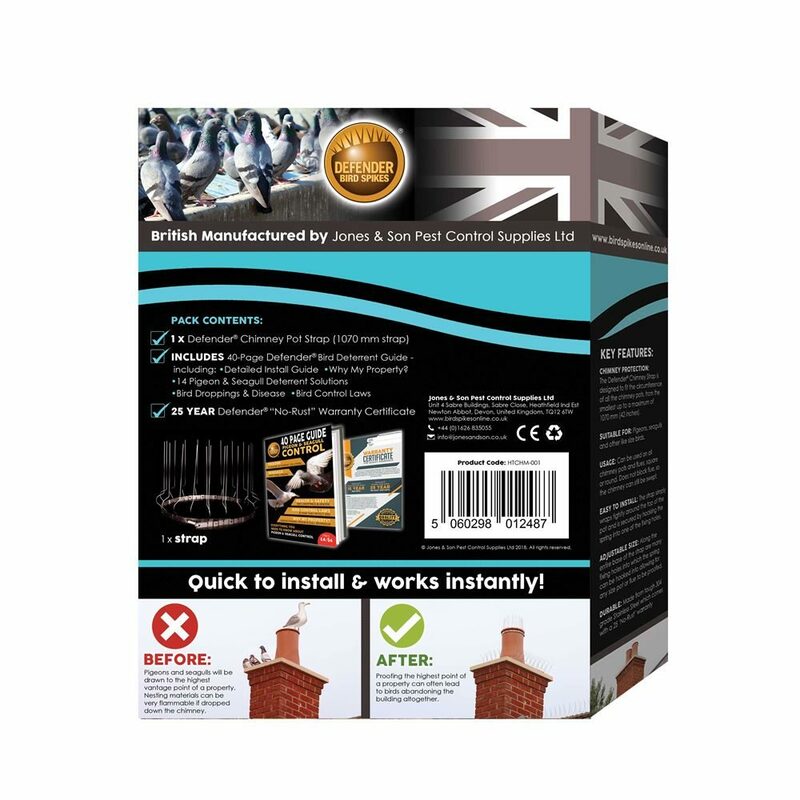 This pigeon anti-roosting system will enable your chimney to be swept properly too, as the chimney sweep's brush will push past and retract with ease over the pigeon control spike. 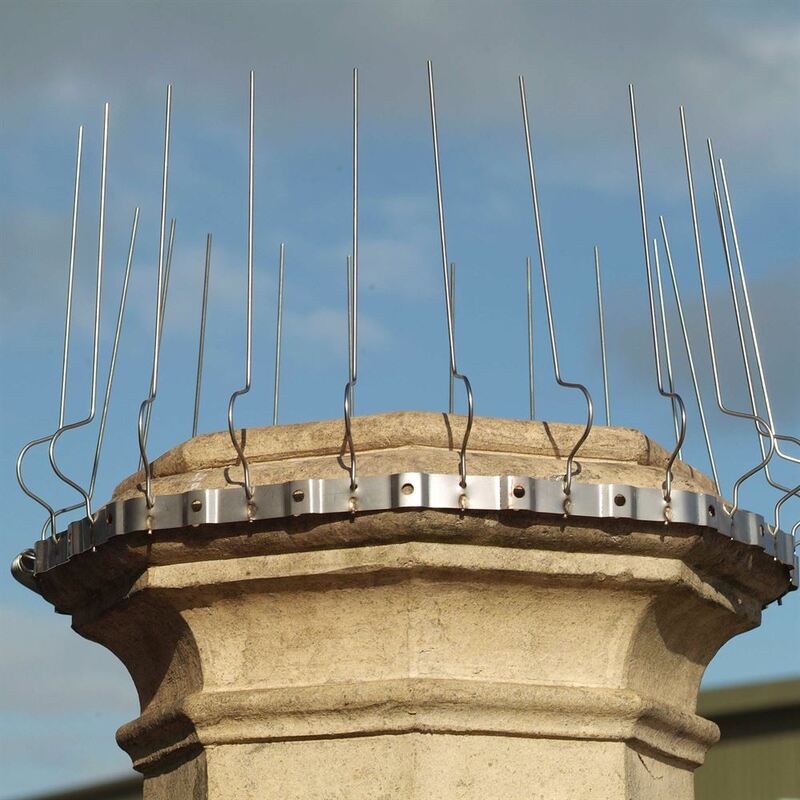 Once installed, this chimney pot spike will stop birds from roosting, nesting or landing on your chimney. 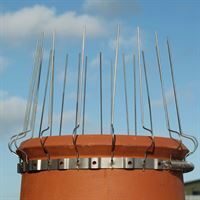 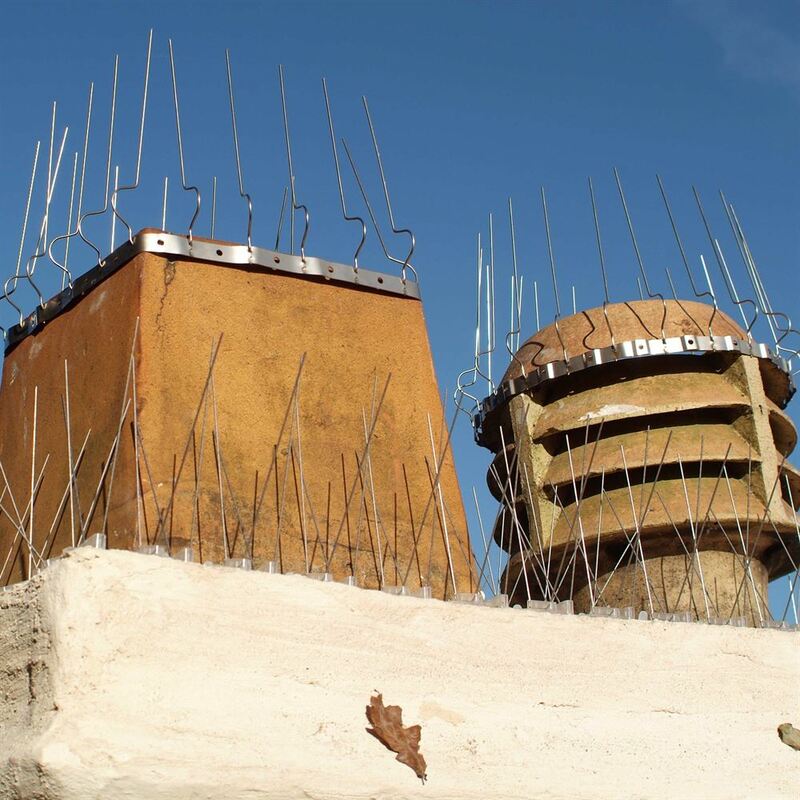 Here are some images of the Defender® Chimney Pot Spikes installed on homes, chimneys and cowls. Defender® Pipe Spikes are the best way to keep birds off your pipes and guttering. These pigeon prevention spikes will stop pigeons and similar sized birds from landing on pipes with a circumference of 2.5 - 15 cm (1 - 6 inches). 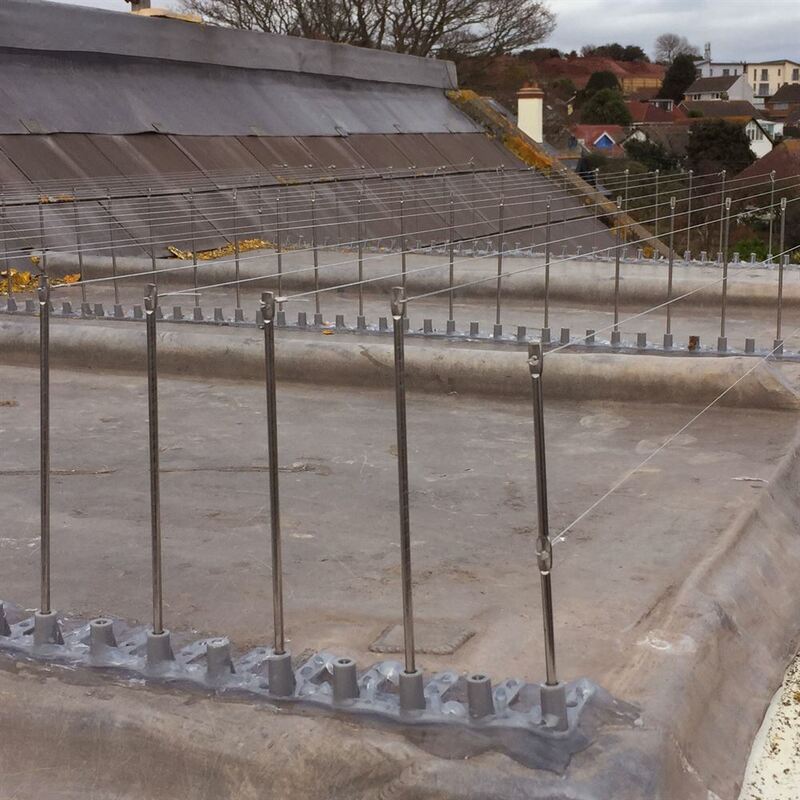 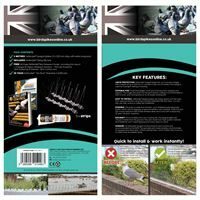 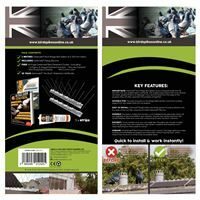 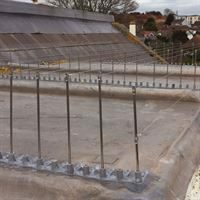 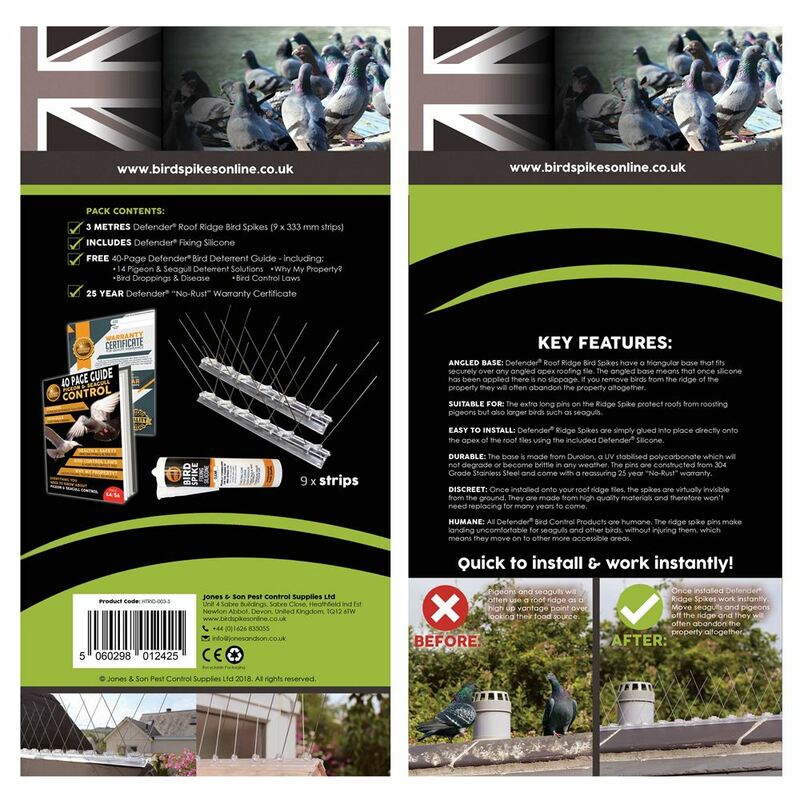 The pigeon control spikes come ready to install and require no extra fixings or glue - you simply tighten the non-slip cable ties around the area of piping which needs protecting. 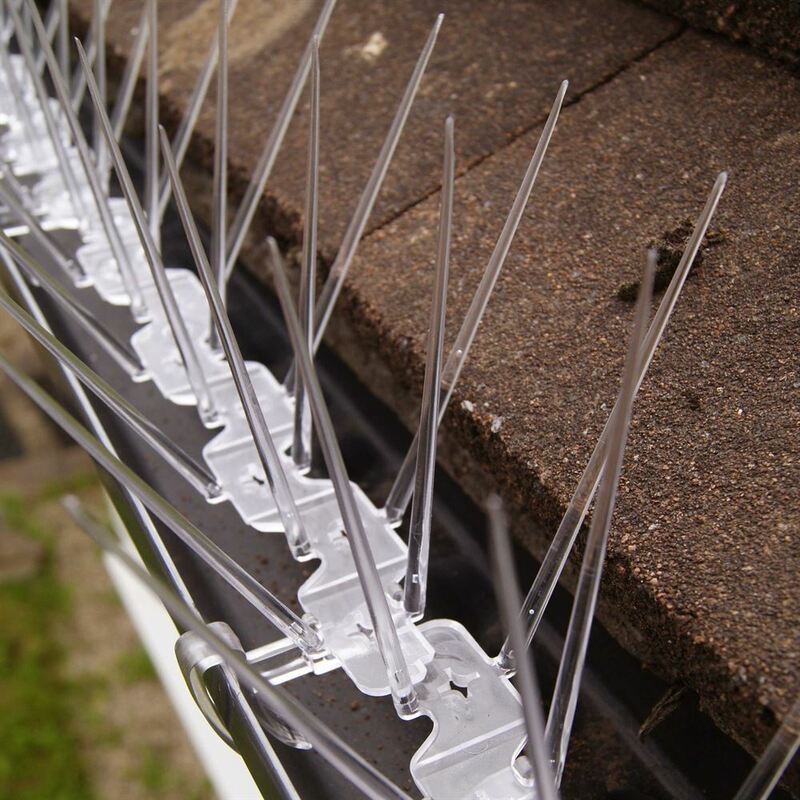 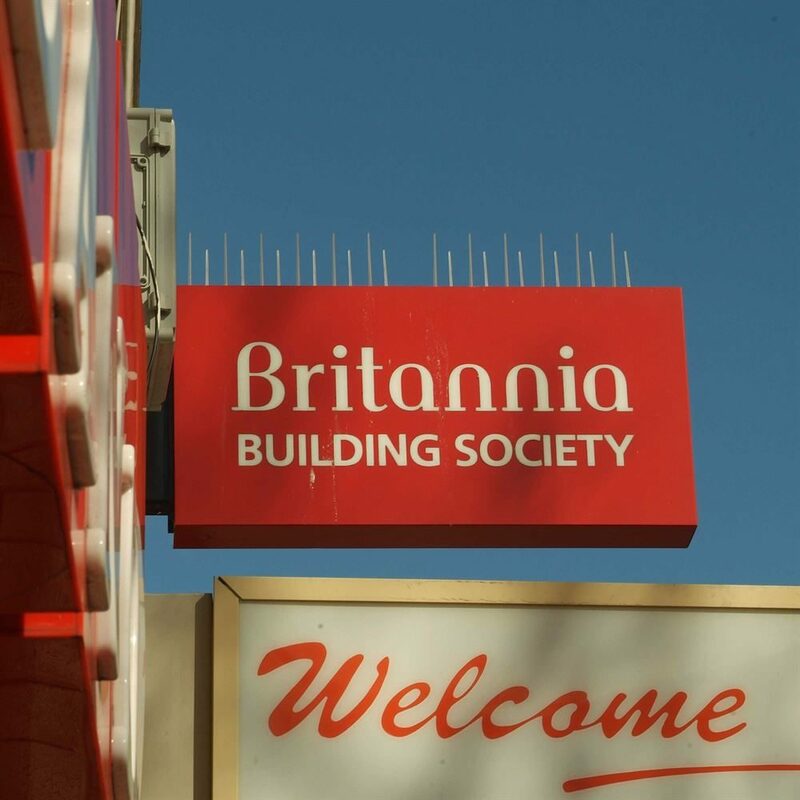 Manufactured in the UK, these pigeon spikes come complete with a 25-Year "No Rust" Warranty. 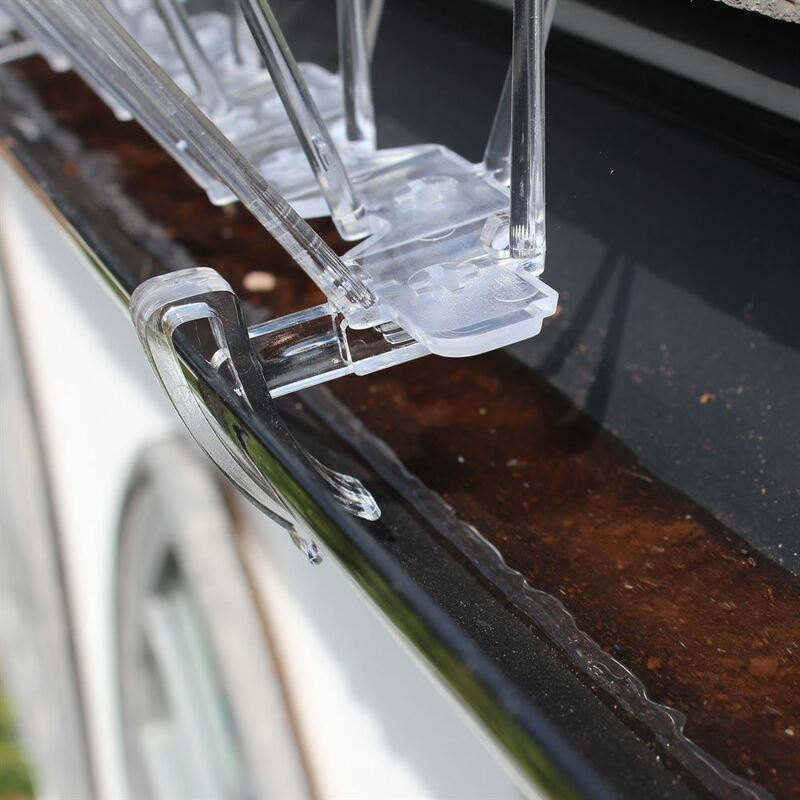 Check out the photos of Defender® Pipe Spikes installed. 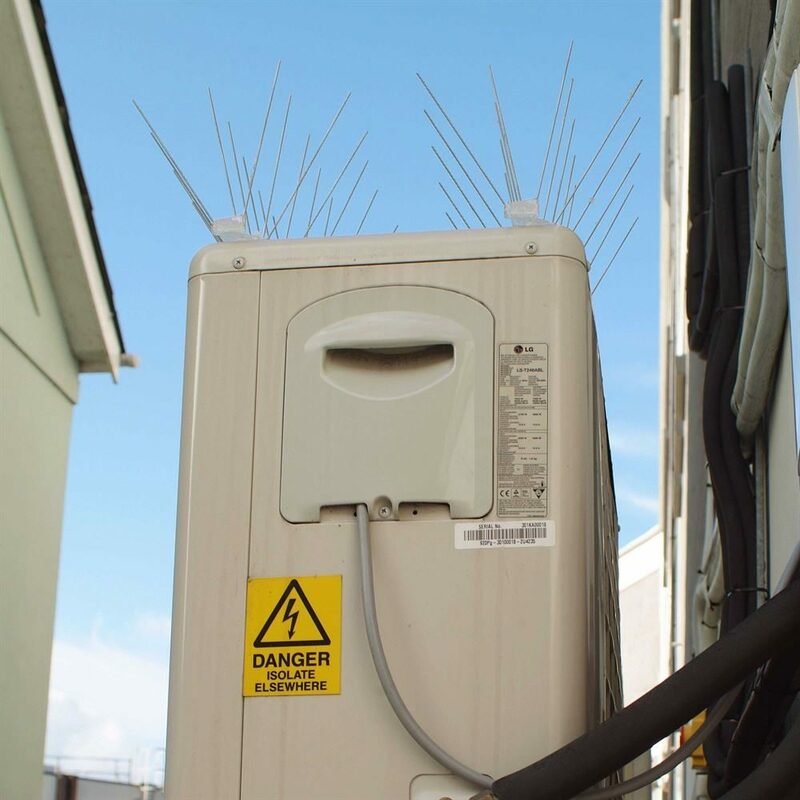 Birds and pigeons can cause havoc with a TV aerial if they choose it as a roosting site or, even worse, nest there. 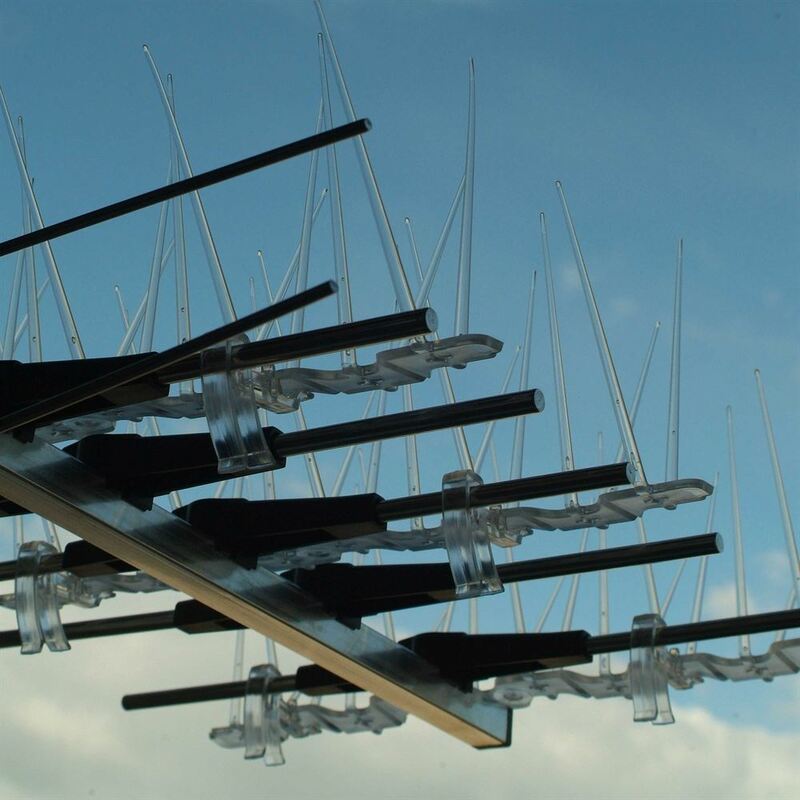 The Defender® TV Aerial Pack will help get rid of birds from your TV aerial as soon as it is installed. 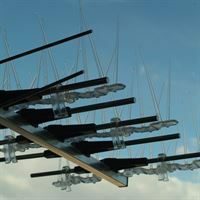 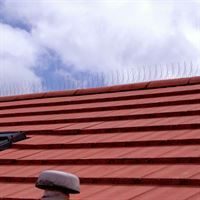 As every aerial is different, the anti-perching spikes can be attached in 3 ways so as to accommodate every type of aerial on the market. 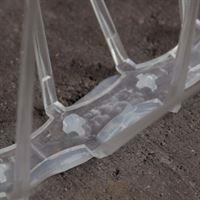 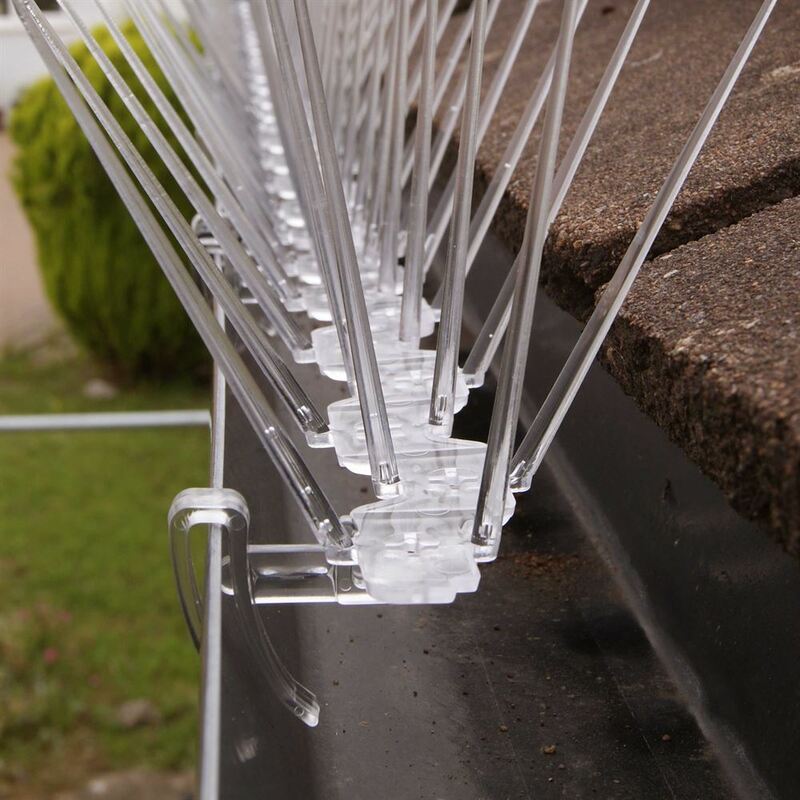 Specially designed clips, cable ties or glue will allow you to protect every inch of the aerial or dish quickly and easily. 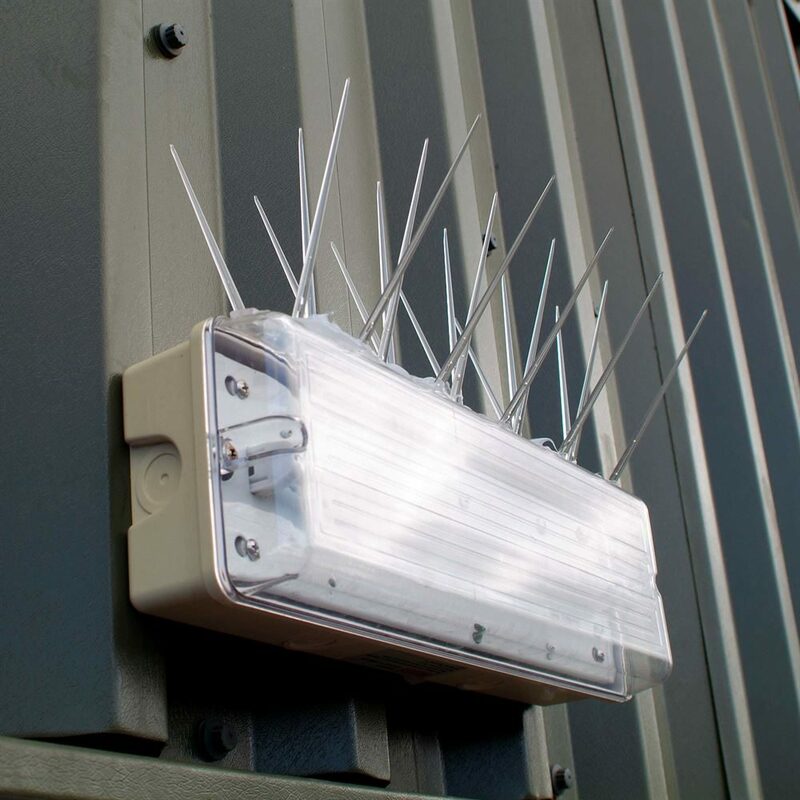 We use only plastic pigeon spikes in the pack so that there will be no interference with your signal. A blocked gutter can cause expensive damage due to water ingress and flooding. 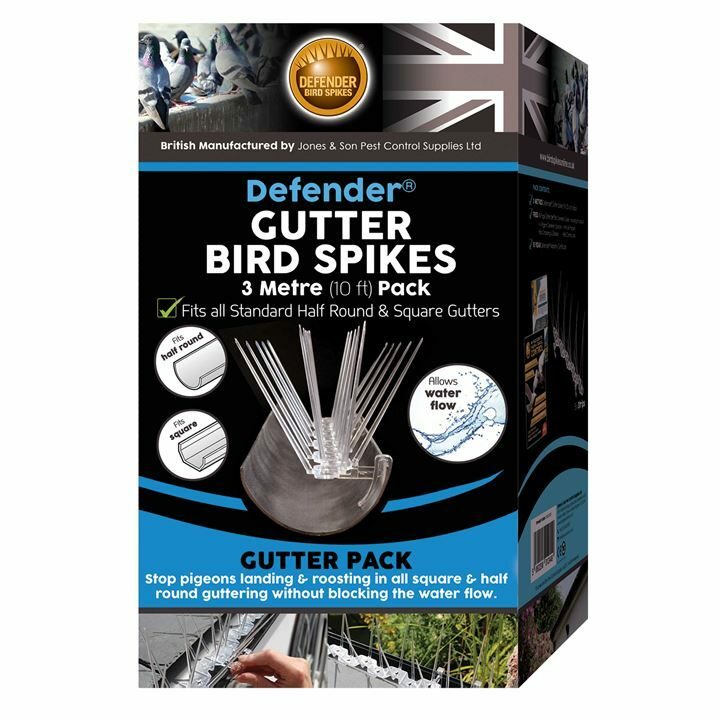 Defender® Gutter Spikes will stop birds from being able to nest or roost in the guttering, and filling the gutter with feathers and leaves. 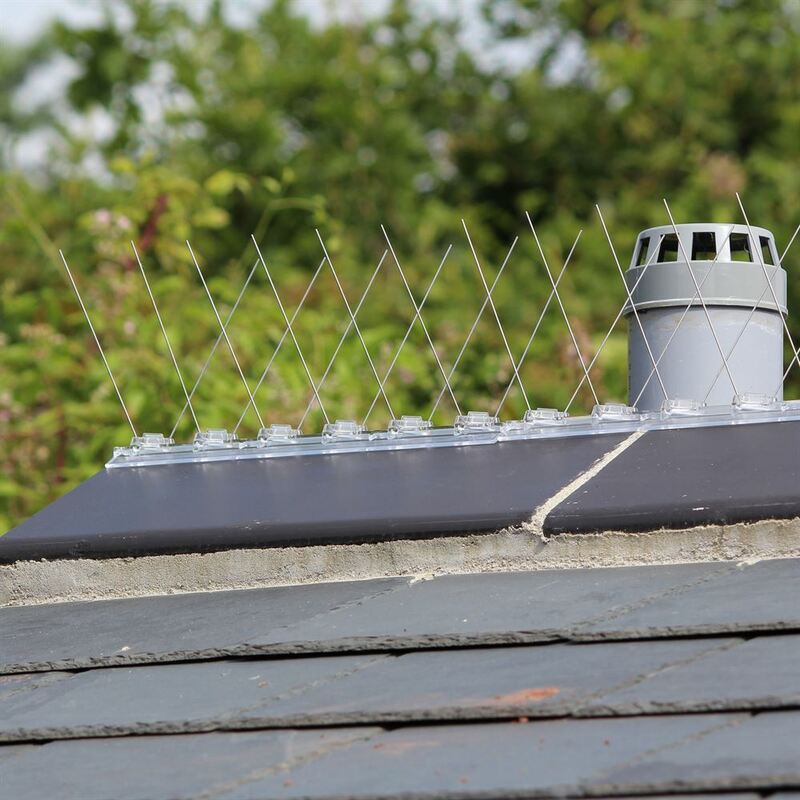 These photos show the installed pigeon gutter deterrent spikes and how quickly and easily they can be attached to the outer lip of the gutter or hopper. 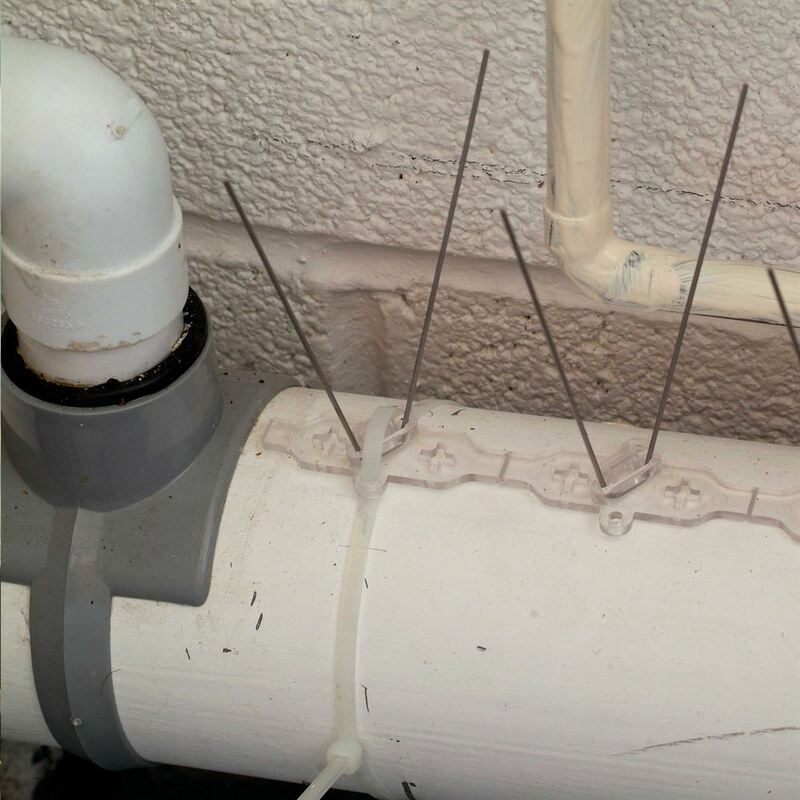 See how they allow water to flow freely beneath the gutter spike. 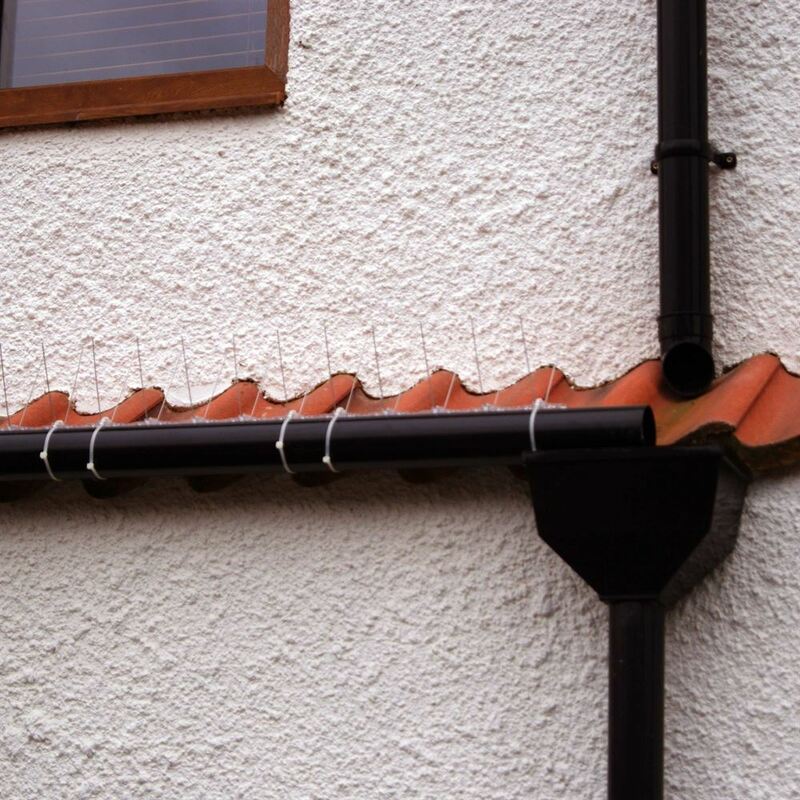 They can simply be pulled off and reattached if you need access to the guttering to clean it. 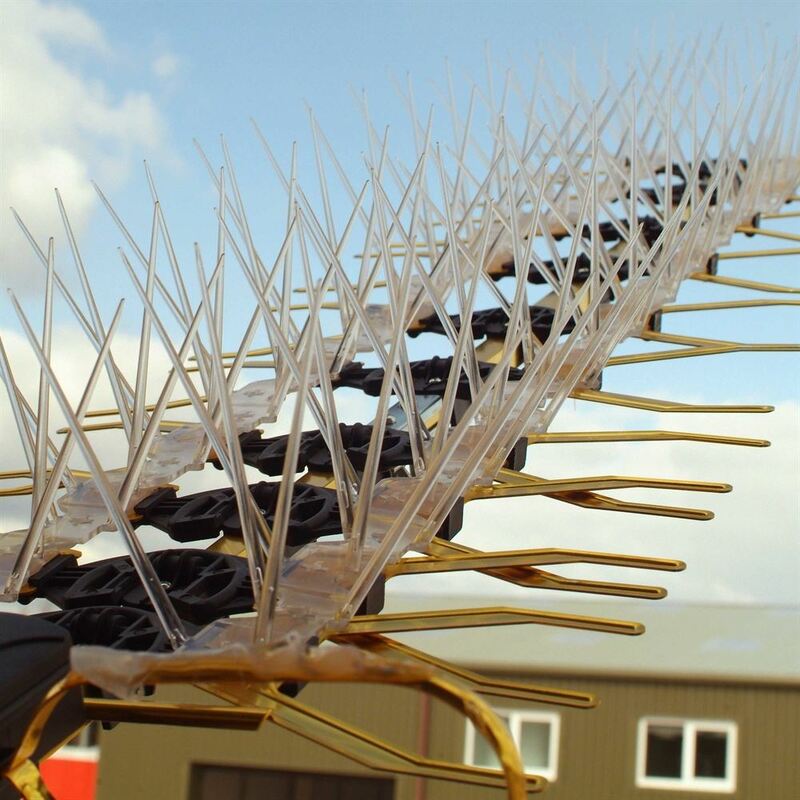 This pigeon repellent will move birds on humanely without hurting them. 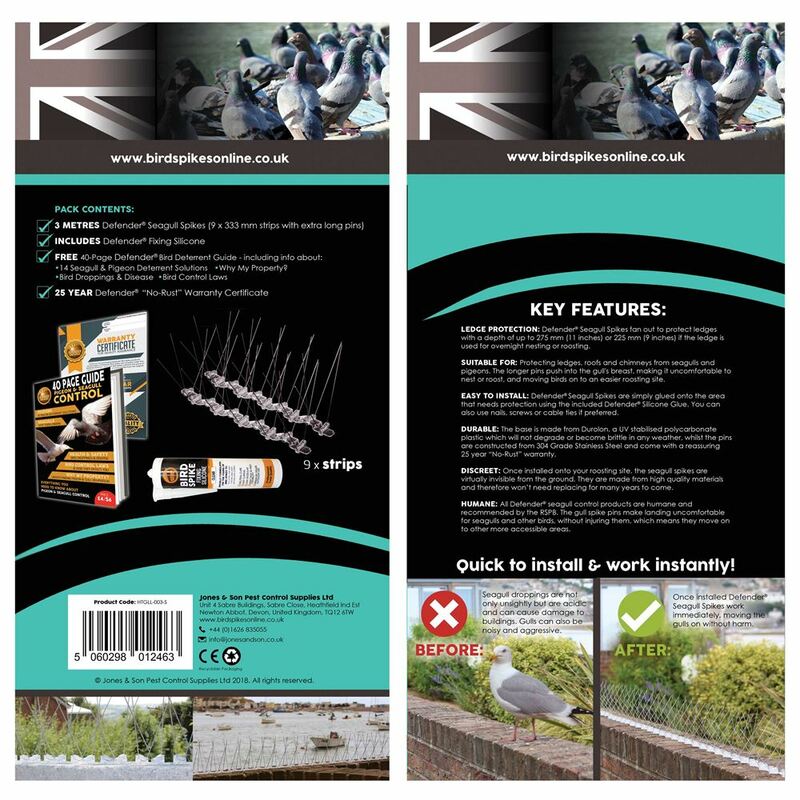 This specially formulated, high tack adhesive is recommended for use with our Defender® bird spikes. 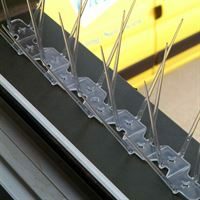 It has been designed to stick to the polycarbonate bases of our pigeon spikes. 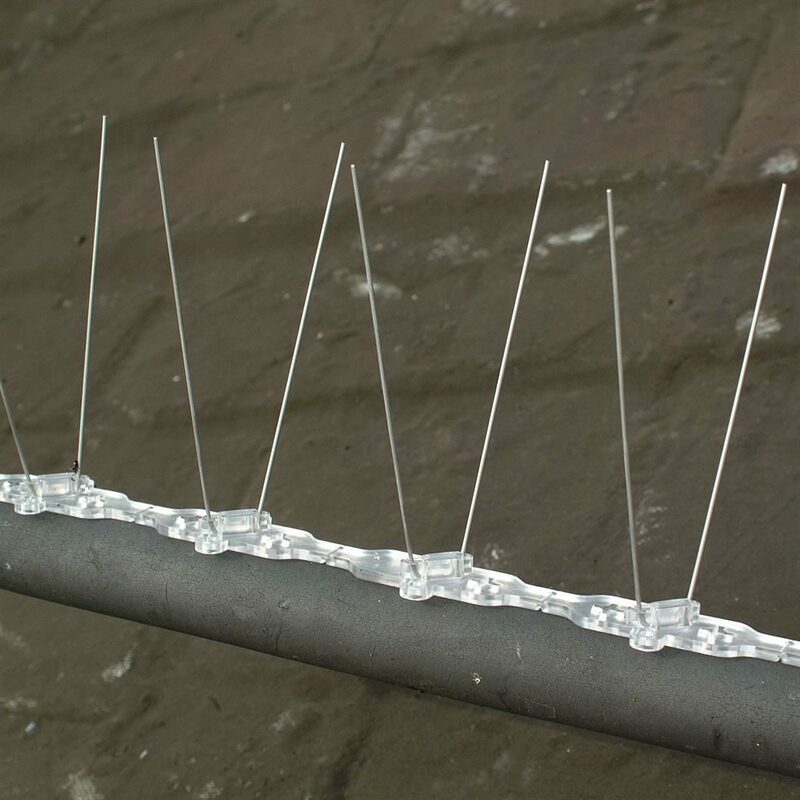 You may find that some other bird spike glues will not adhere correctly to the plastic base. 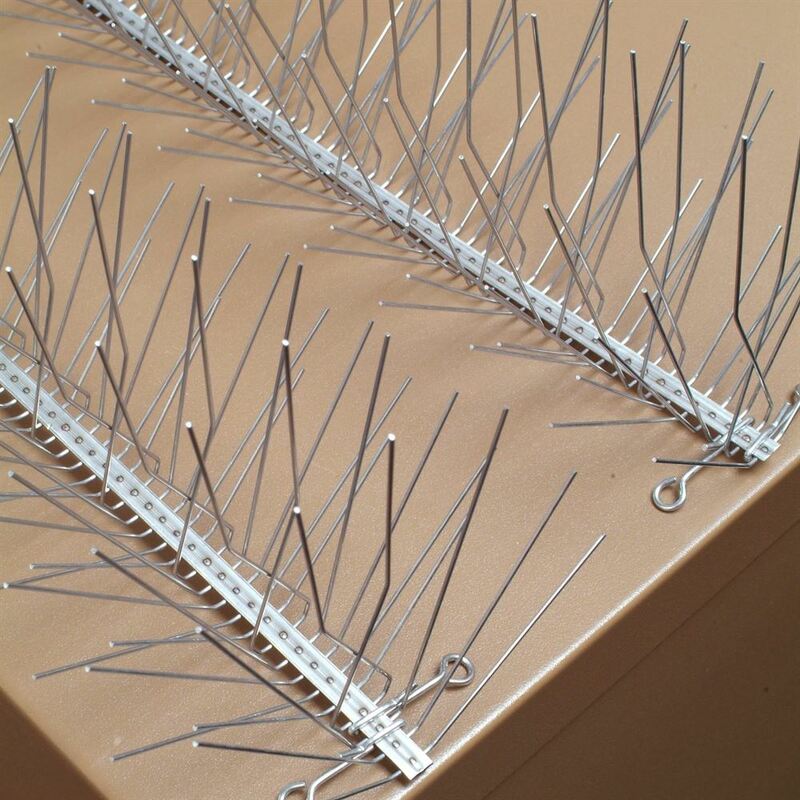 Bird and pigeon deterrent spikes can be glued with this spike adhesive to any surface including concrete, brick, cement, roofing tiles, wood, lead, glass, steel, plastic, and all other clean, dry surfaces. 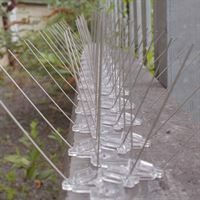 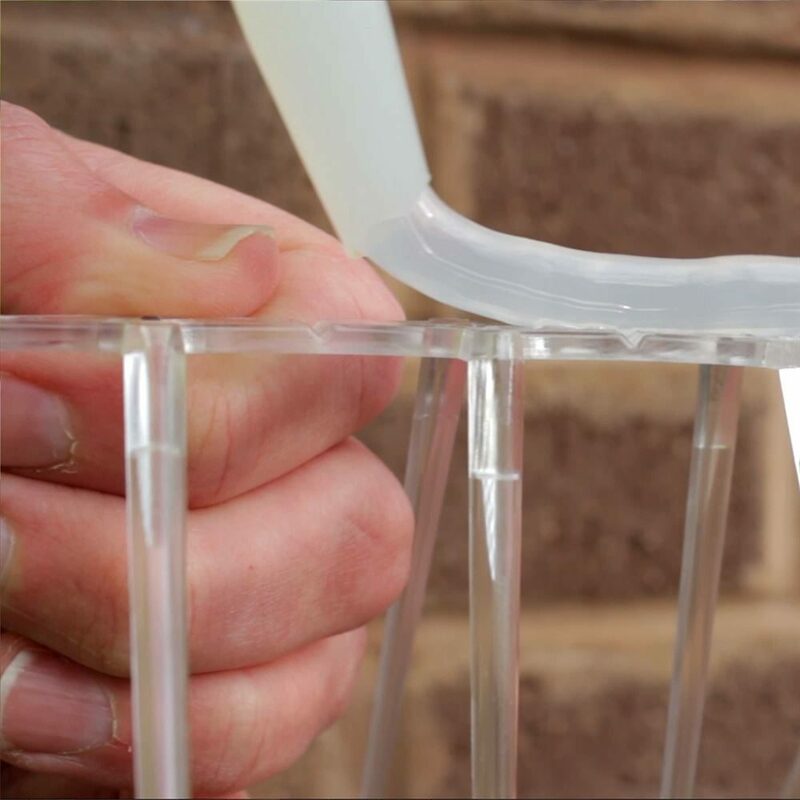 This high tack and highly flexible bird spike silicone is perfect for installing our bird deterrents quickly and easily. 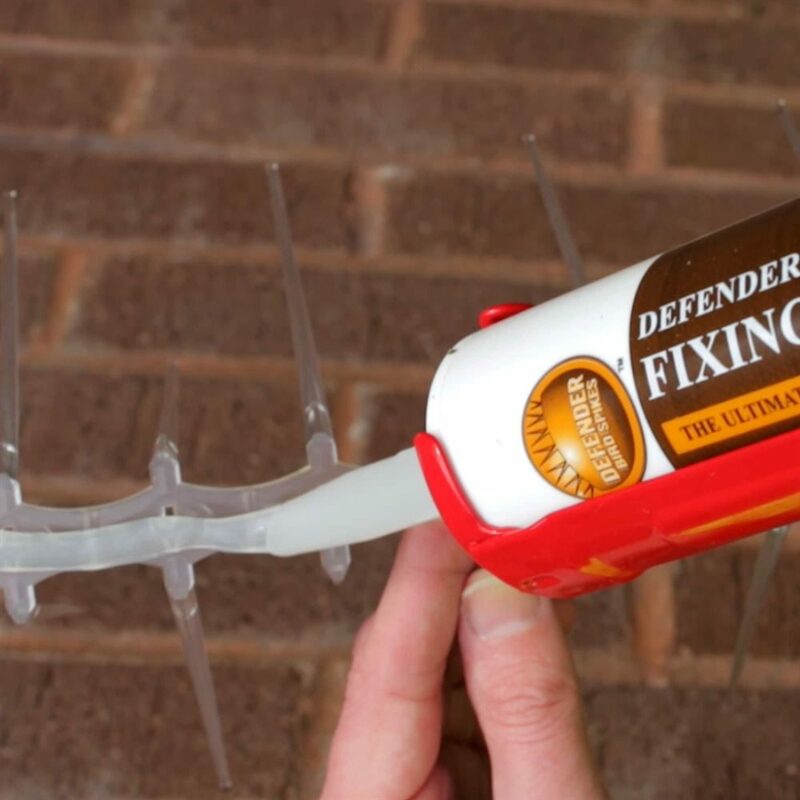 This Defender® 4 Steel Bird Prevention Spike is a tried and tested performer. 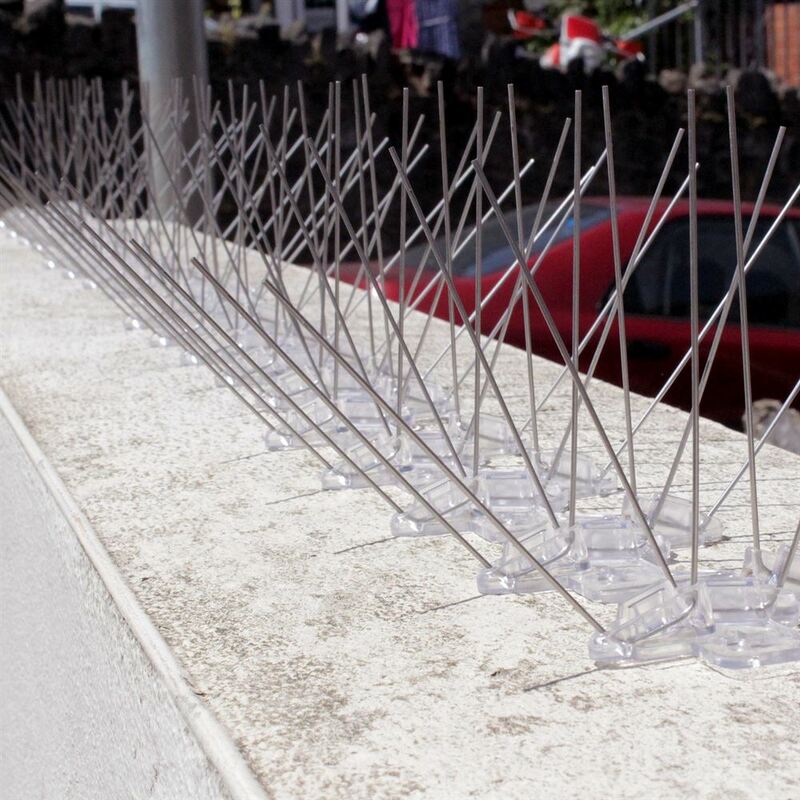 Its strong stainless steel pins will help keep away any unwanted pigeons or similar sized birds. 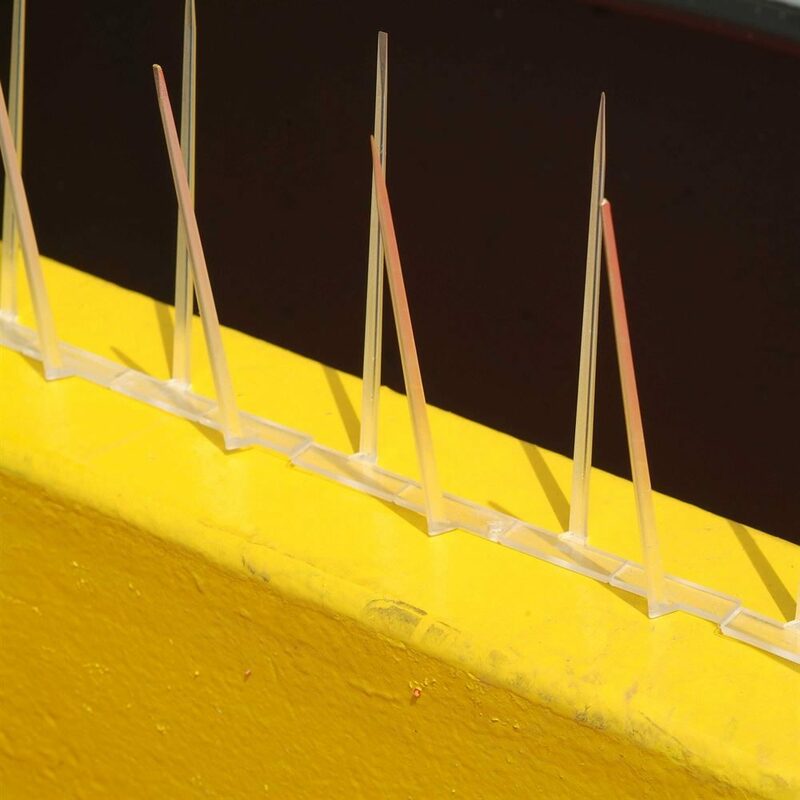 This humane bird control spike makes it uncomfortable for them to land and does not cause them injury or harm. 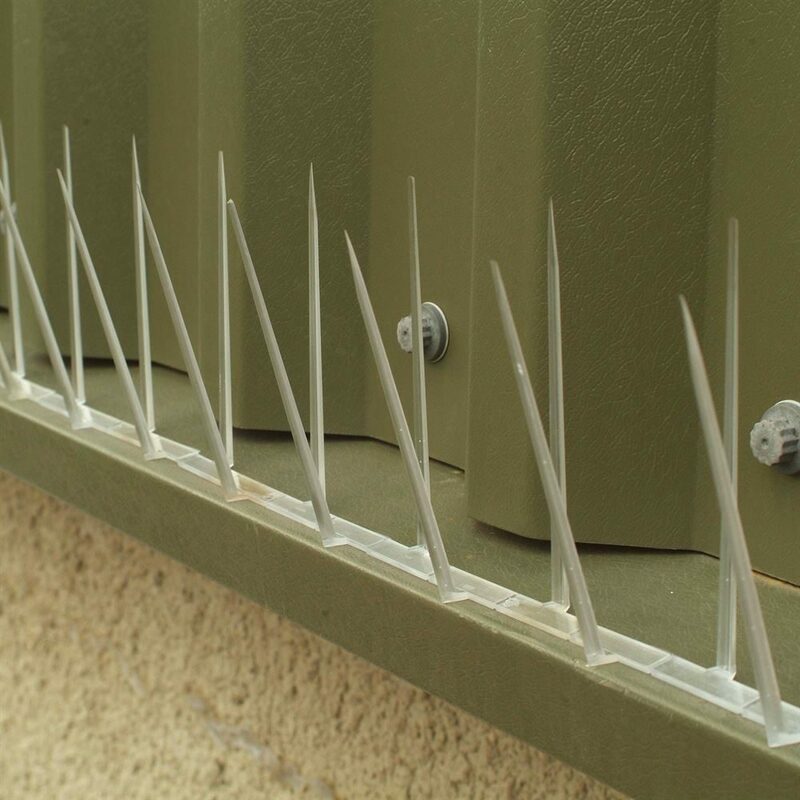 Suitable for use on ledges up to 20 cm or 4 inches wide - the Defender® 4 Stainless Steel Bird Prevention Spike will keep birds off your property as soon as it is installed! 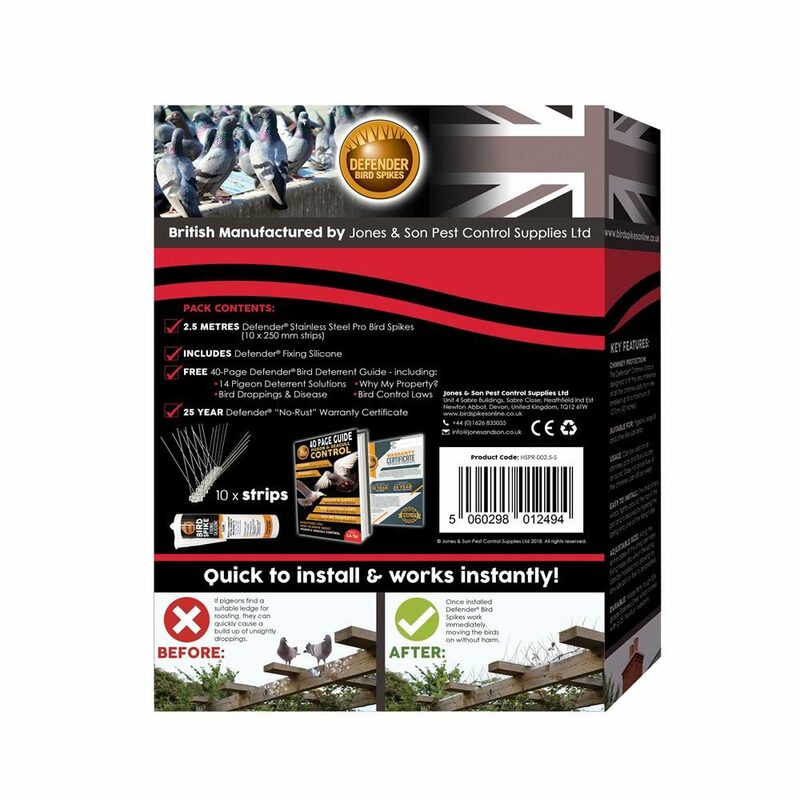 This bird spike is made by Jones and Son Pest Control Supplies Ltd in the UK and includes a 25-Year "No Rust" Warranty. 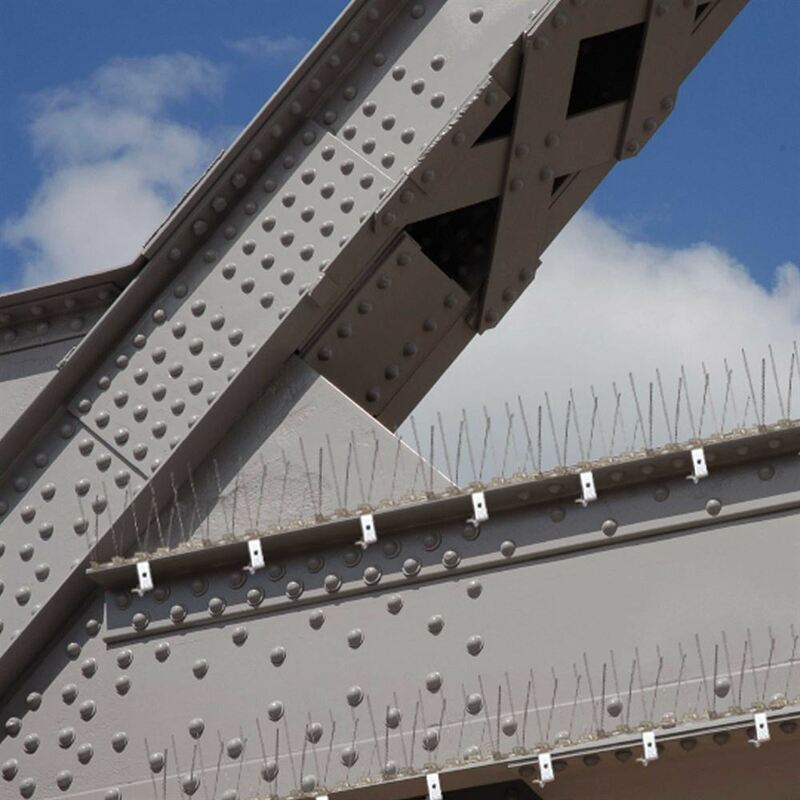 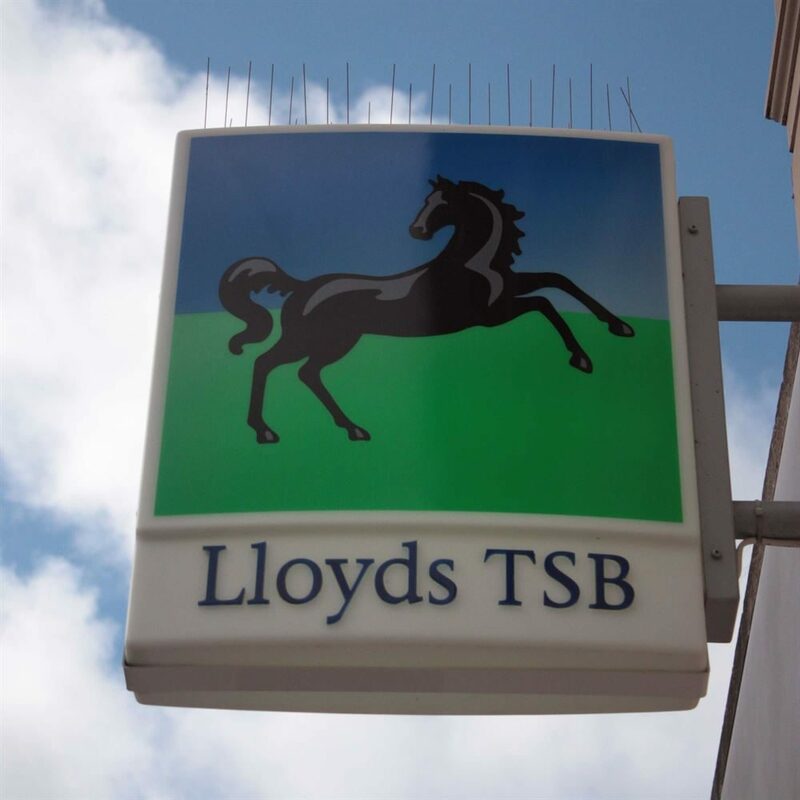 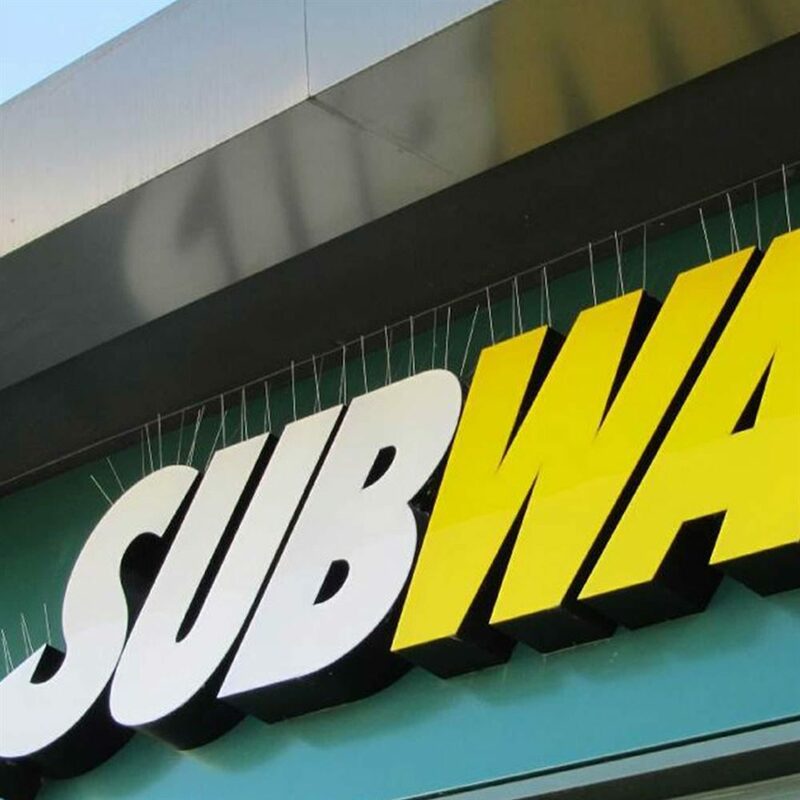 View some of the Narrow Steel Spikes installed on signage, flat roofs and girders. The Defender® Starling and Sparrow Spike is the ultimate all rounder. 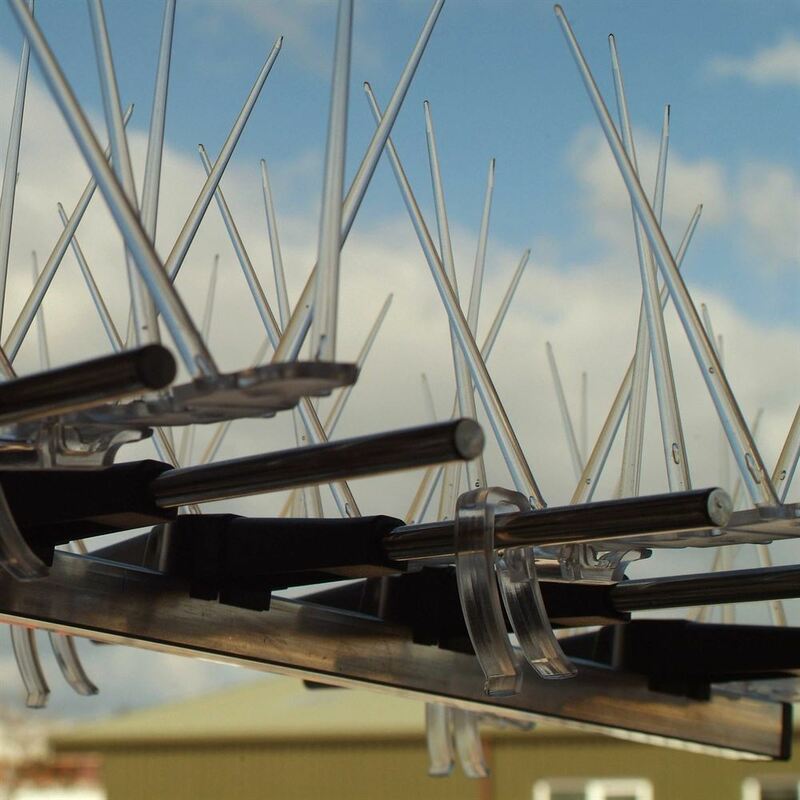 Not only does this anti-roosting spike repel pigeons, birds and seagulls, it is the only bird spike to be a suitable deterrent for small birds like sparrows, starlings, swallows, blackbirds and crows as well. 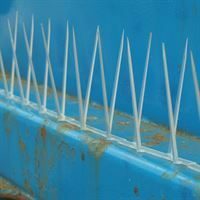 This high quality sparrow spike comes in 60 cm lengths and can protect ledges of up to 10cm wide. 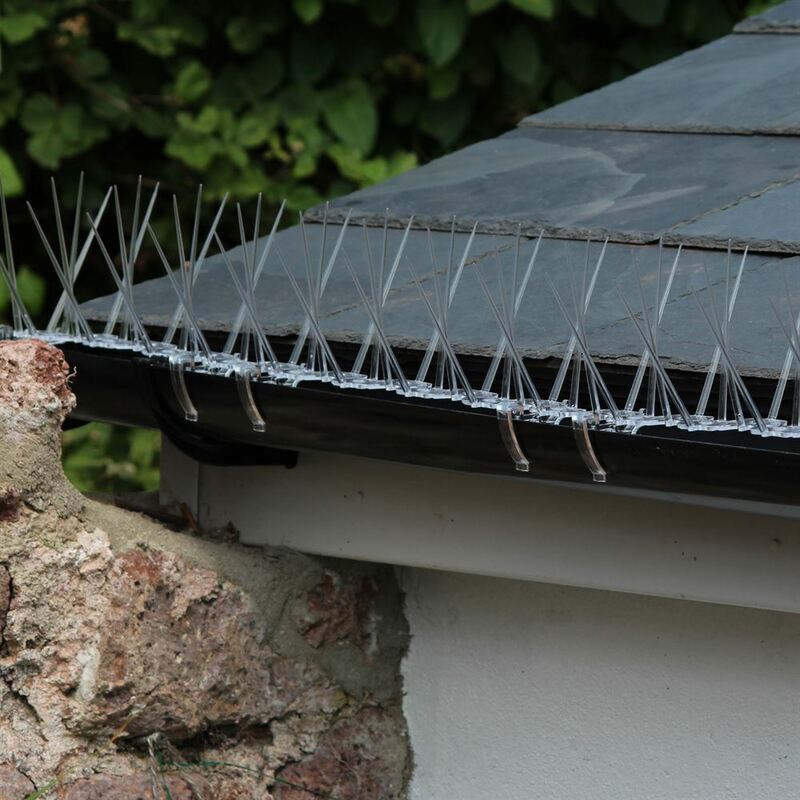 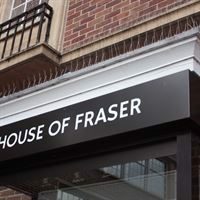 Have a look at photos of Defender® Starling and Sparrow Spikes installed and stopping small birds from being able to land on ledges, beams and soffits. 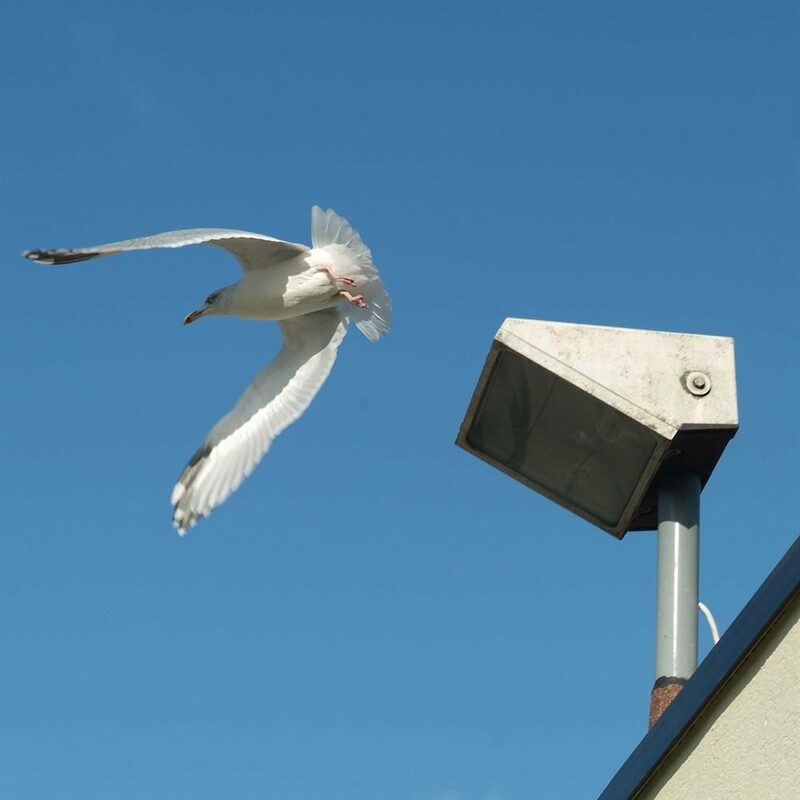 The Defender® Solar Panel Bird Spike prevents pigeons, seagulls and other birds from gaining access under solar panels. 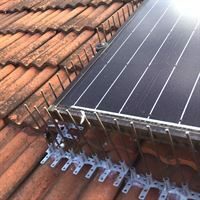 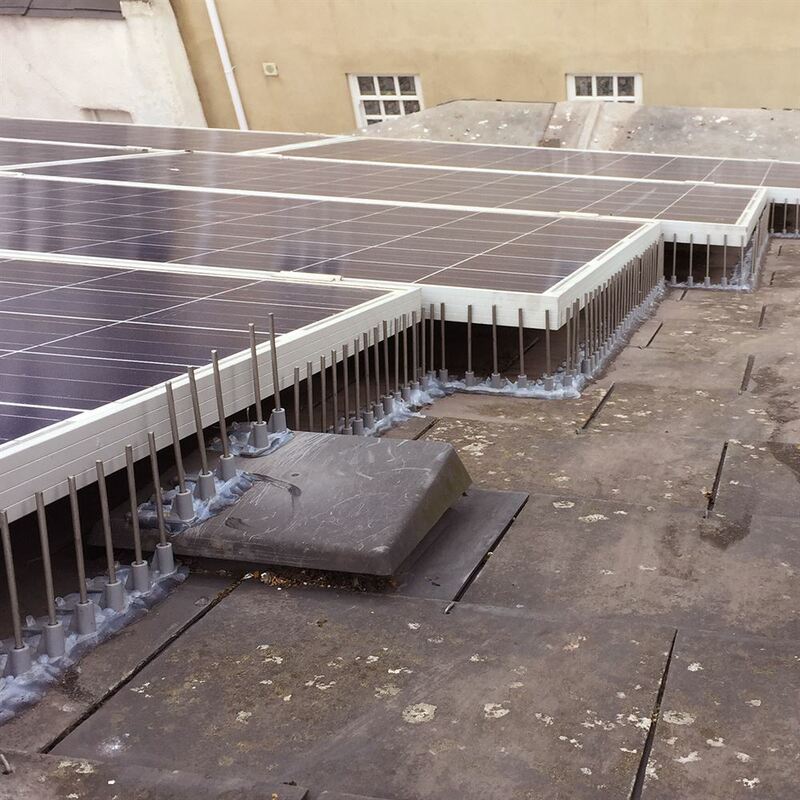 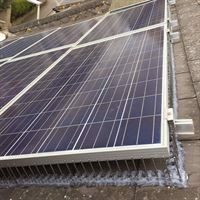 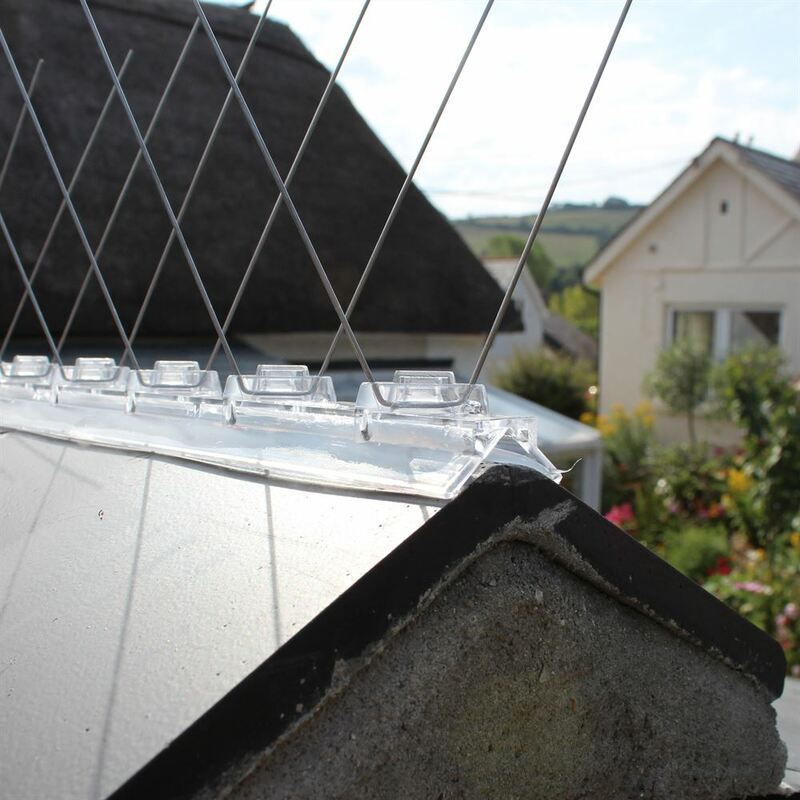 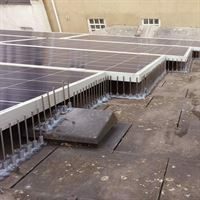 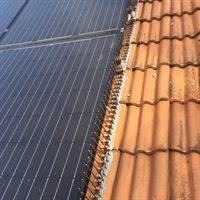 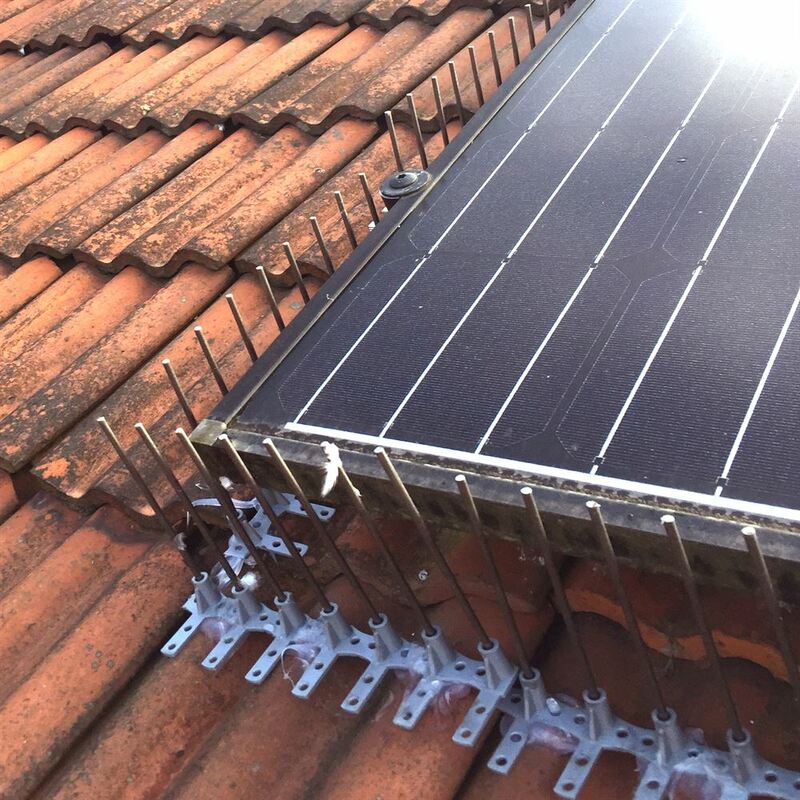 It comes pre-assembled with a choice of 4 different stainless steel pins of varying heights to protect gaps between the roof tiles and the solar panel of up to 15 cm or 6 inches. The pins create bars which act as a barrier and do allow the pigeon to push its way under the solar panel. 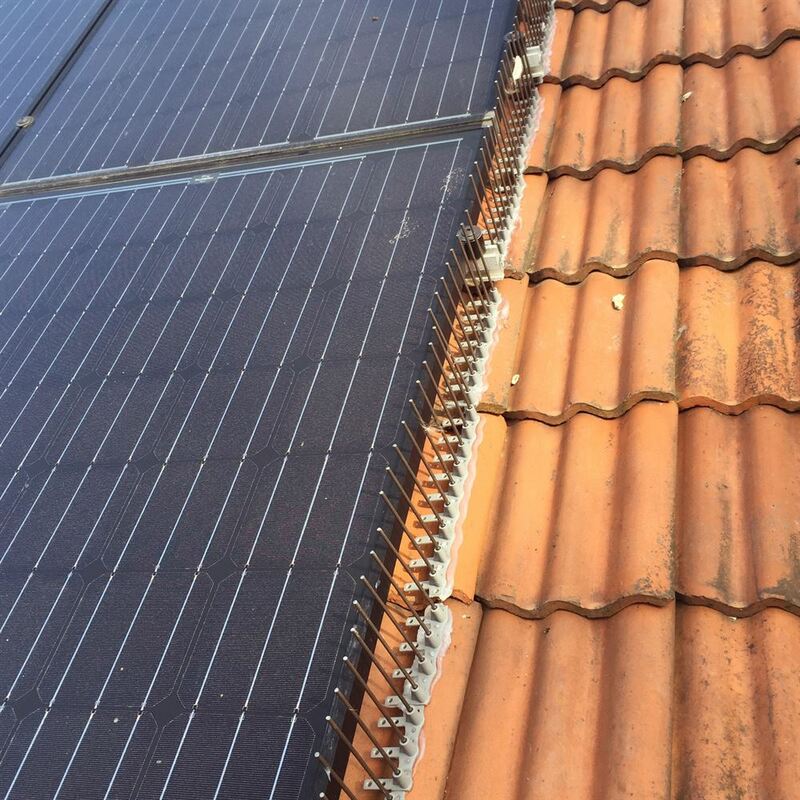 As these pins do not touch the solar panel, there is no chance of invalidating the manufacturer's warranty. 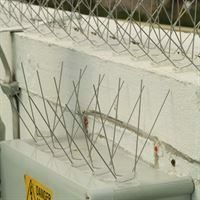 The Defender® Solar Panel Bird Spike is quickly and easily glued into place and, because of its anti-topple stabilisers, will stay firm and strong even when persistent pigeons try to push past the posts. 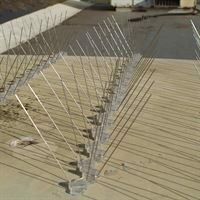 Defender® Bird Post and Wire Holders are an innovative system to keep birds and pigeons off ledges. 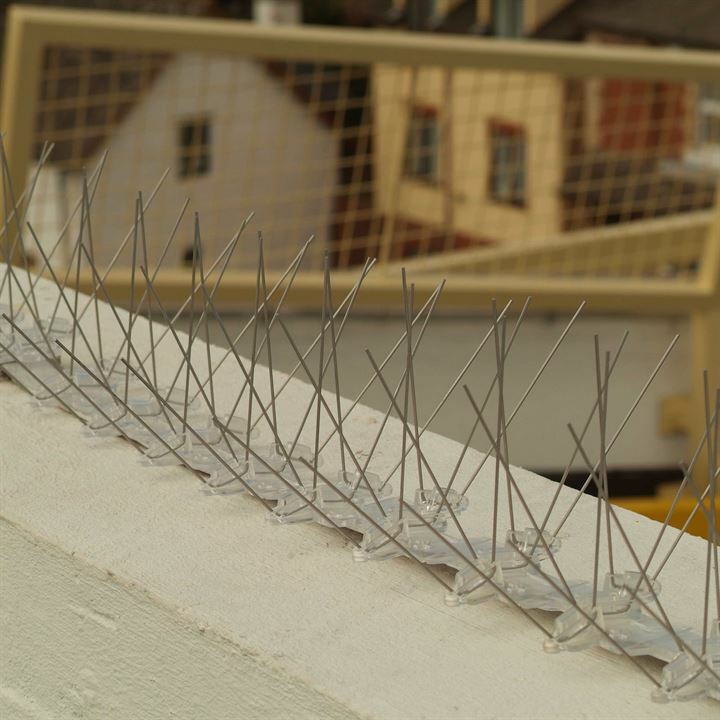 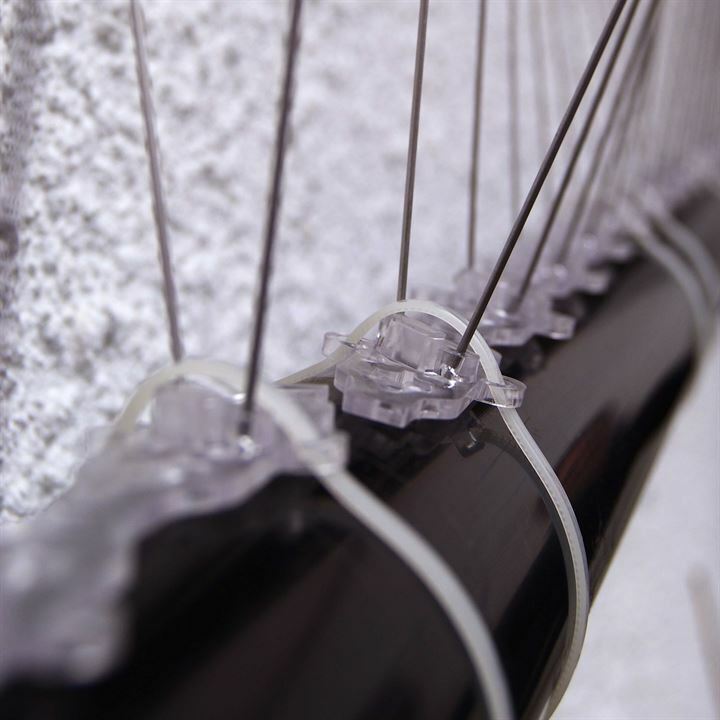 Recommended by architects and property maintenance companies, bird wire is a near invisible bird proofing product. 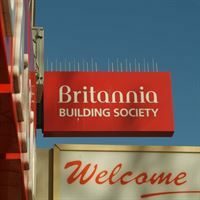 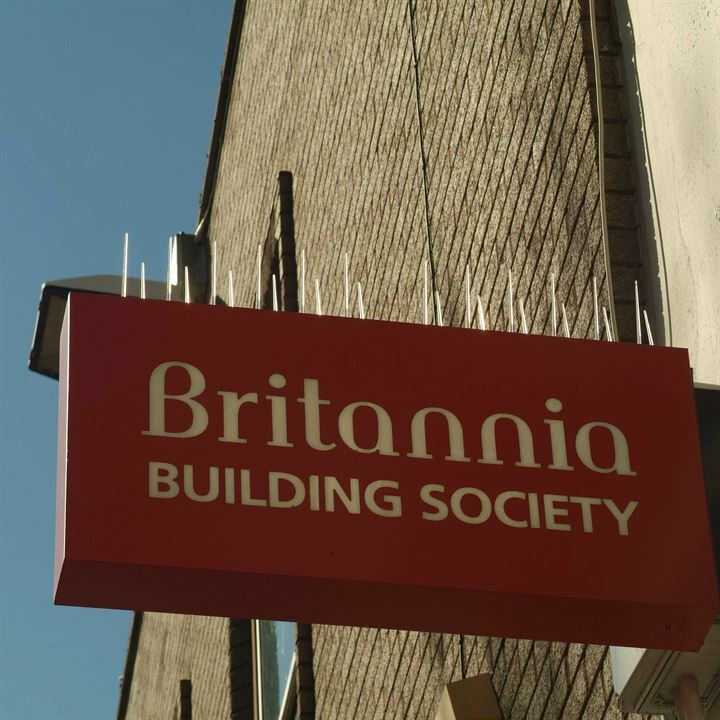 In the past, post and wire systems needed careful measuring and invasive drilling to be installed on buildings, which could cause water ingress and stress fractures to the stone and brickwork as a consequence. 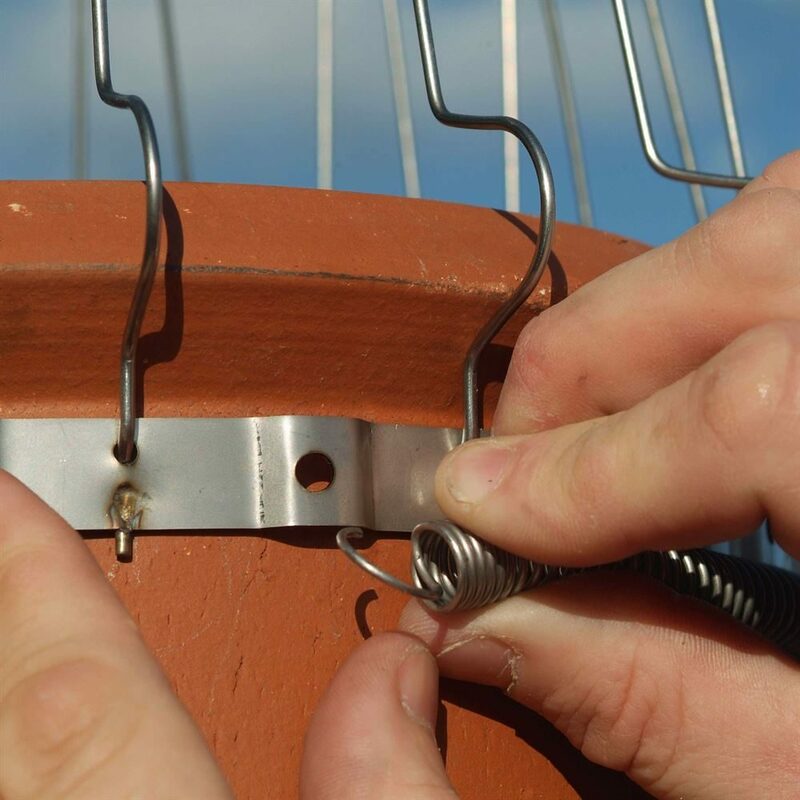 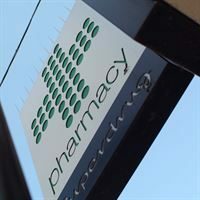 Defender® Bird Post and Wire Holders are simply siliconed to the surface, ensuring no damage. 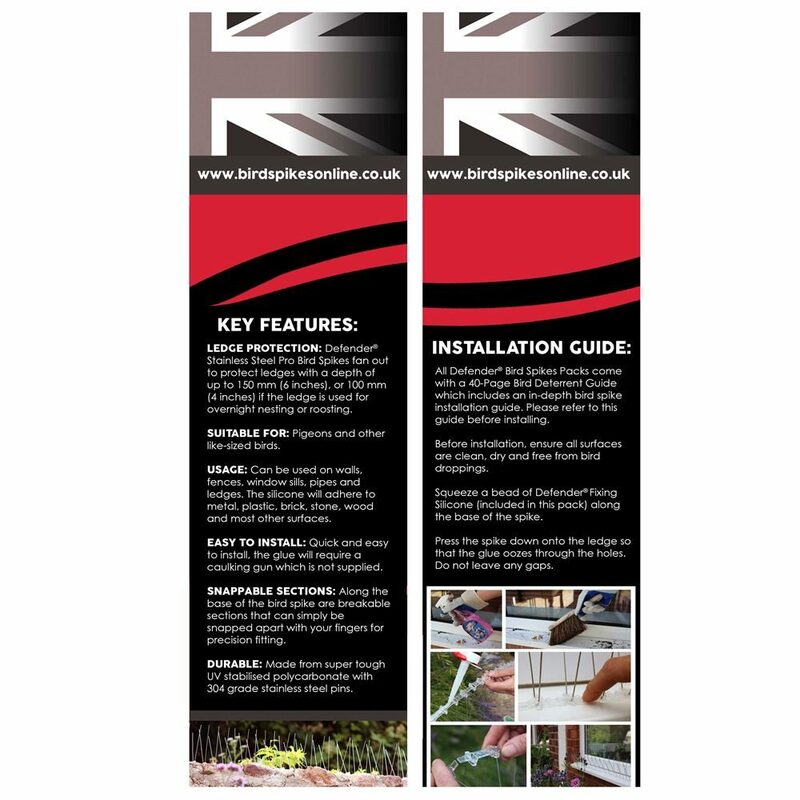 The strips are also pre-assembled so no measuring is required. 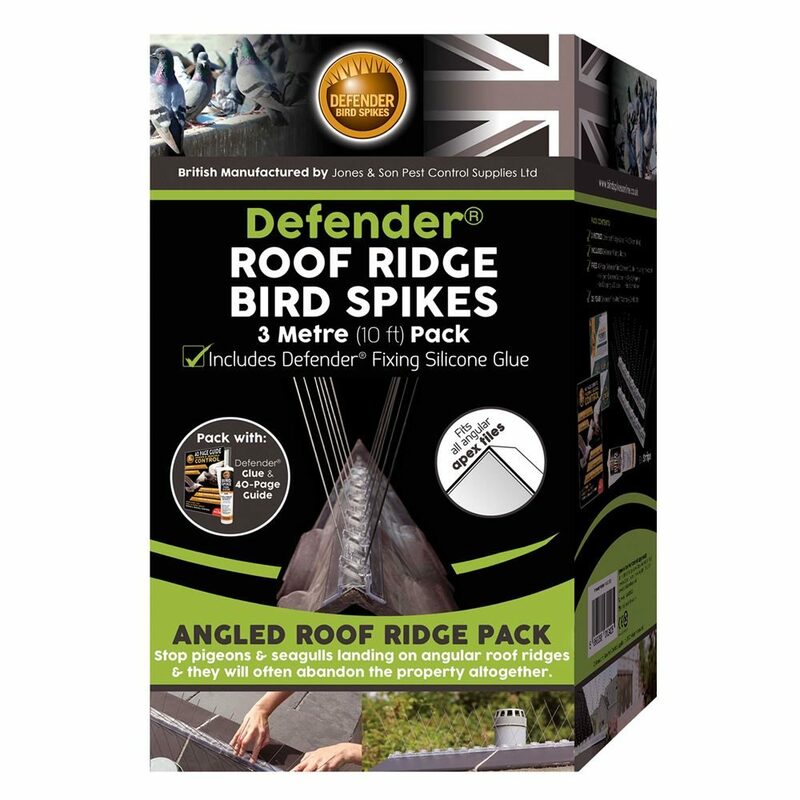 The Defender® Roof Ridge Bird Spike Pack contains all you need to completely proof all angled roof ridge tiles from pigeons and seagulls. 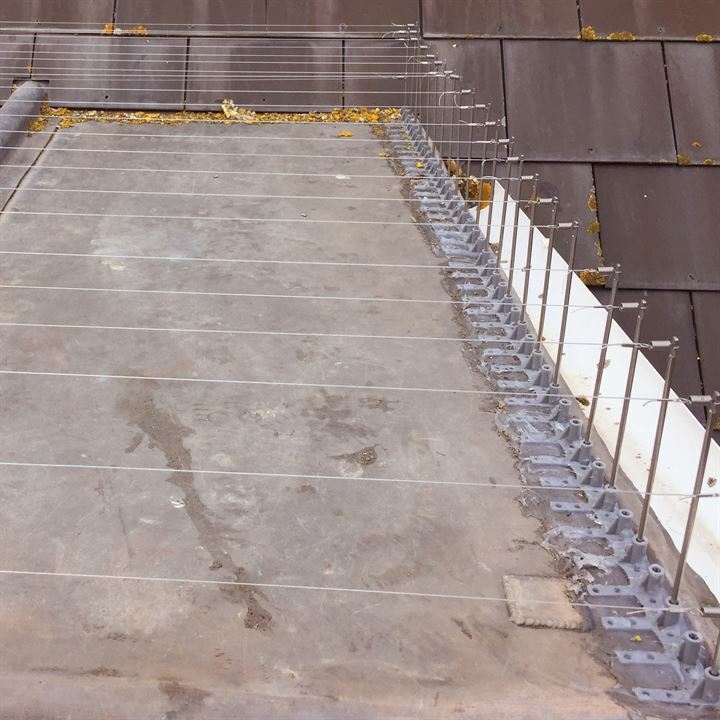 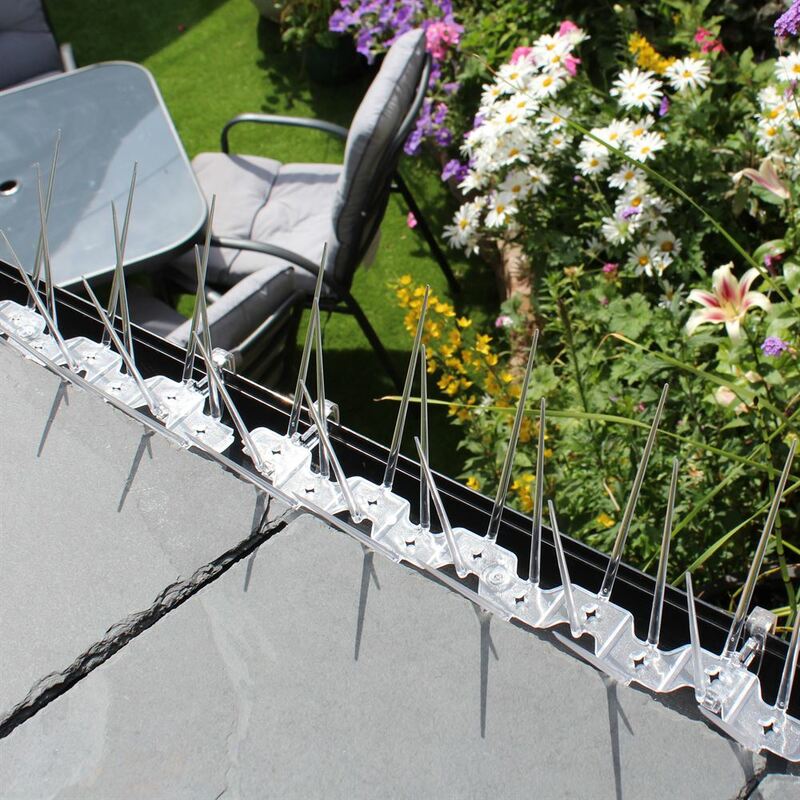 There are 9 strips of ridge spike which fit all angular apex tiles perfectly with its V shaped base, thereby preventing slippage during installation. 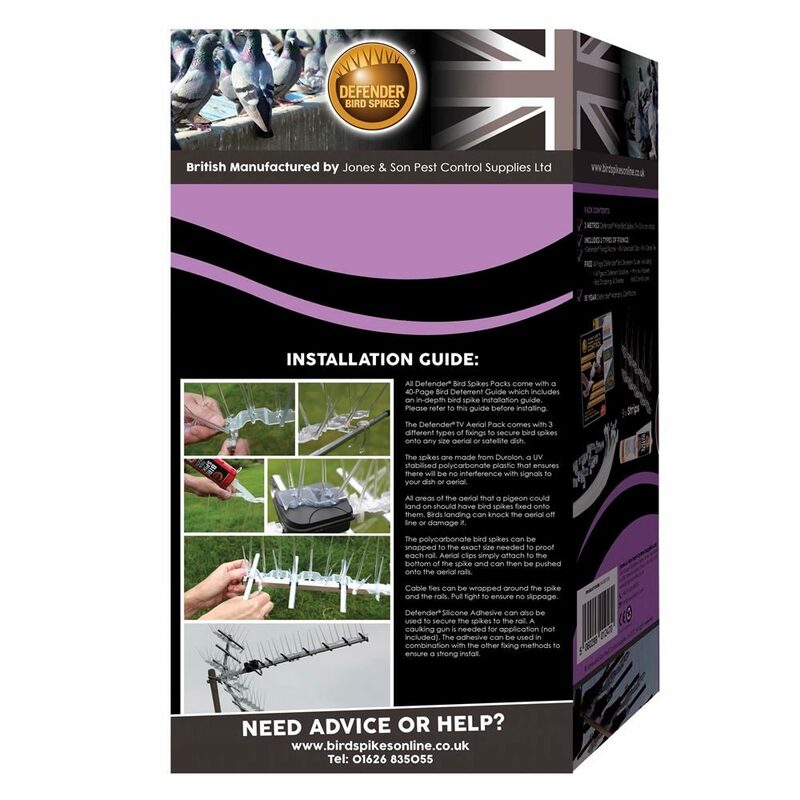 This pack includes the correct amount of Silicone and an informative 40-page pigeon deterrent guide. 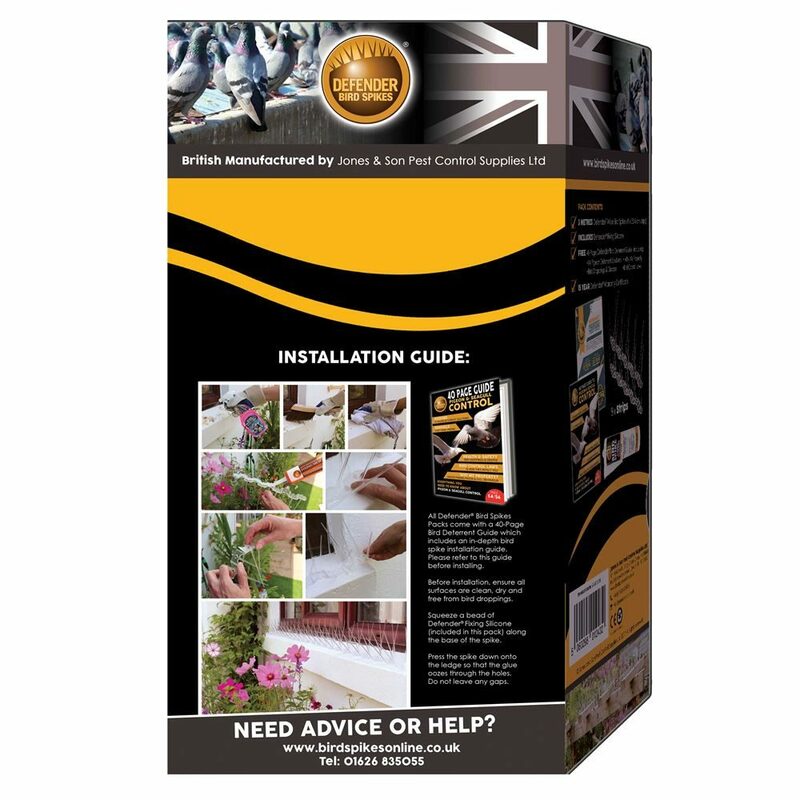 The packaging itself has a simple installation guide printed on its side along with great photographs depicting installation itself. 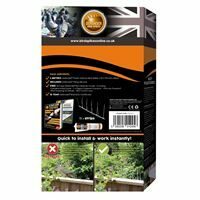 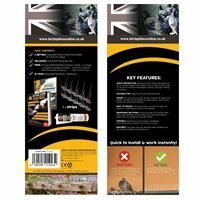 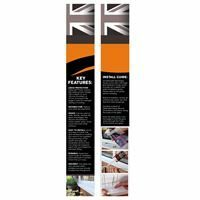 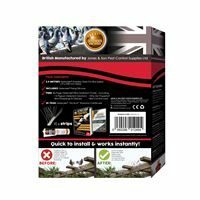 Defender® Stainless Steel Pro Bird Spikes 2.5 Metre Pack contains everything you need to proof a ledge or window sill on your property from landing pigeons and like sized birds. 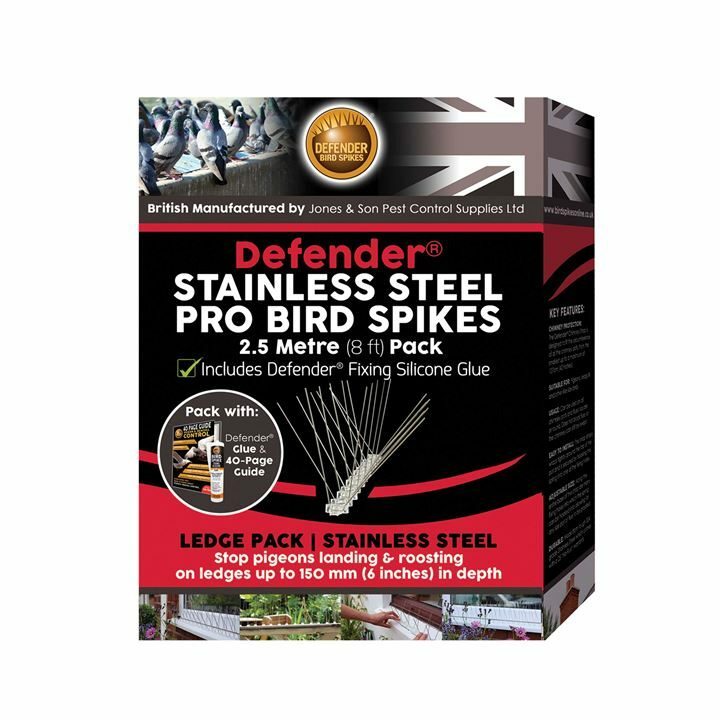 There are 10 Stainless Steel Pro Strips of 250 mm each and enough Defender® Silicone to install all 2.5 metres of bird spikes. 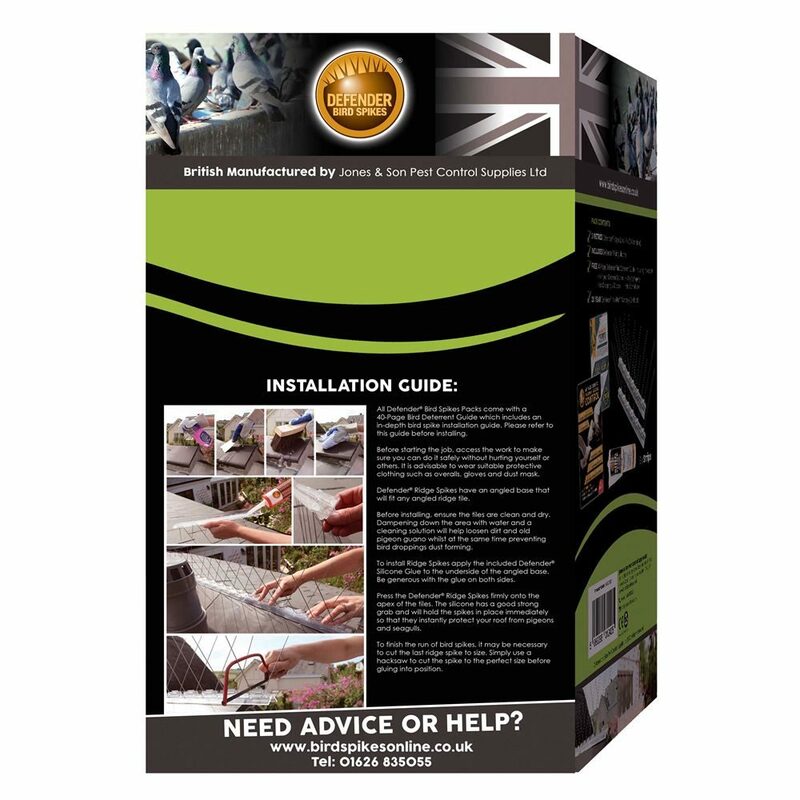 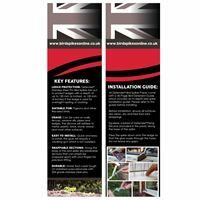 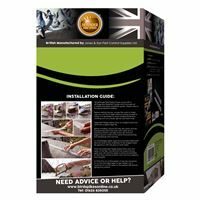 Inside the handy 40 page bird control guide is a easy to follow installation guide, along with a Pro specific installation guide along the side of the pack. 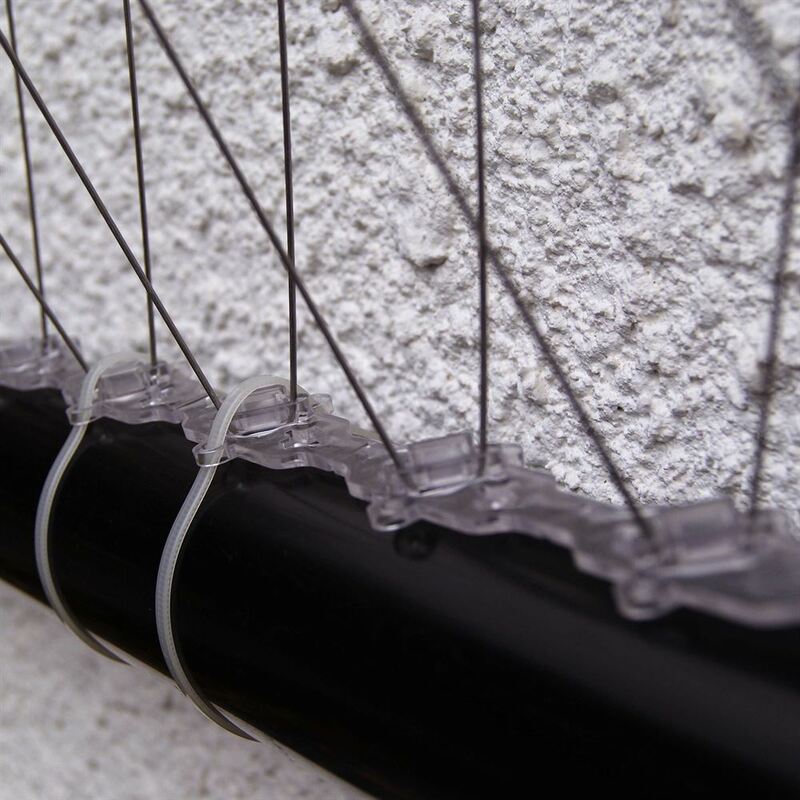 Protect narrow ledges, pipes and window sills with the Defender® Plastic Narrow Bird Spikes Pack. 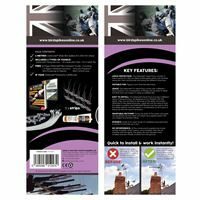 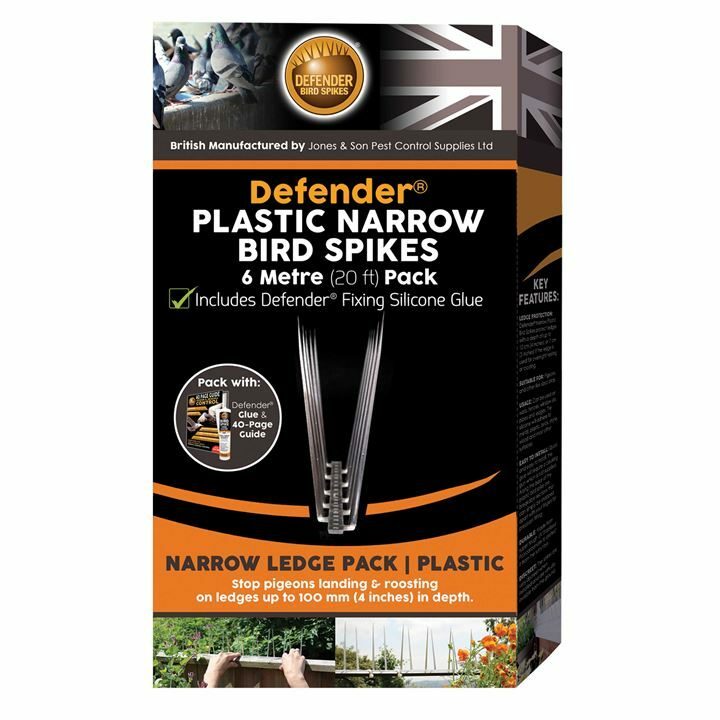 This kit contains 6 metres of narrow bird spikes and enough Defender® Silicone Glue to complete the job of proofing your property against pigeons. 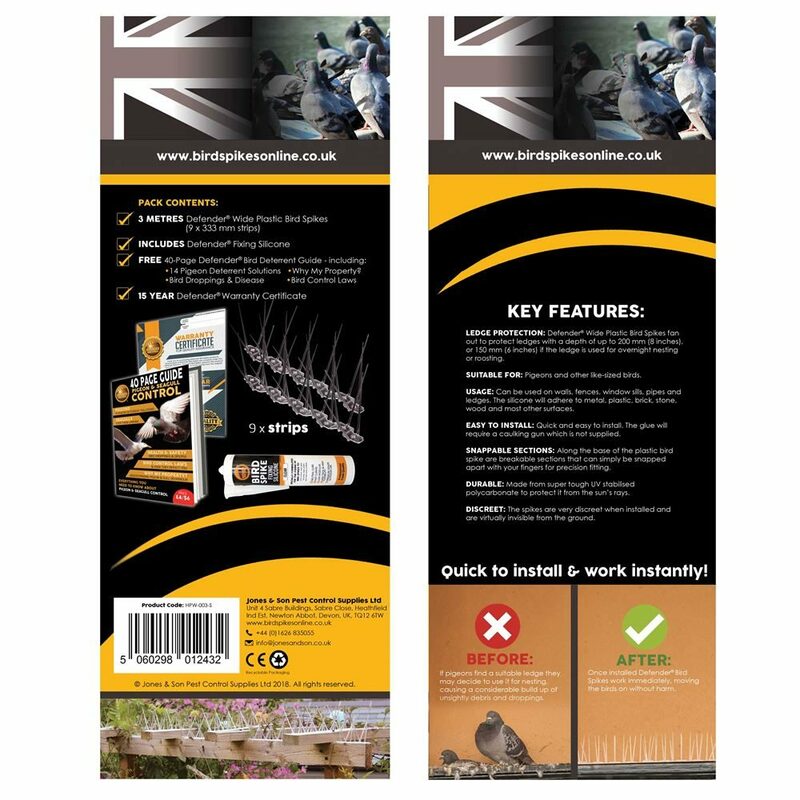 A 285 ml tube of glue is included, along with a wonderful guide full of fascinating articles on bird and pigeon control. 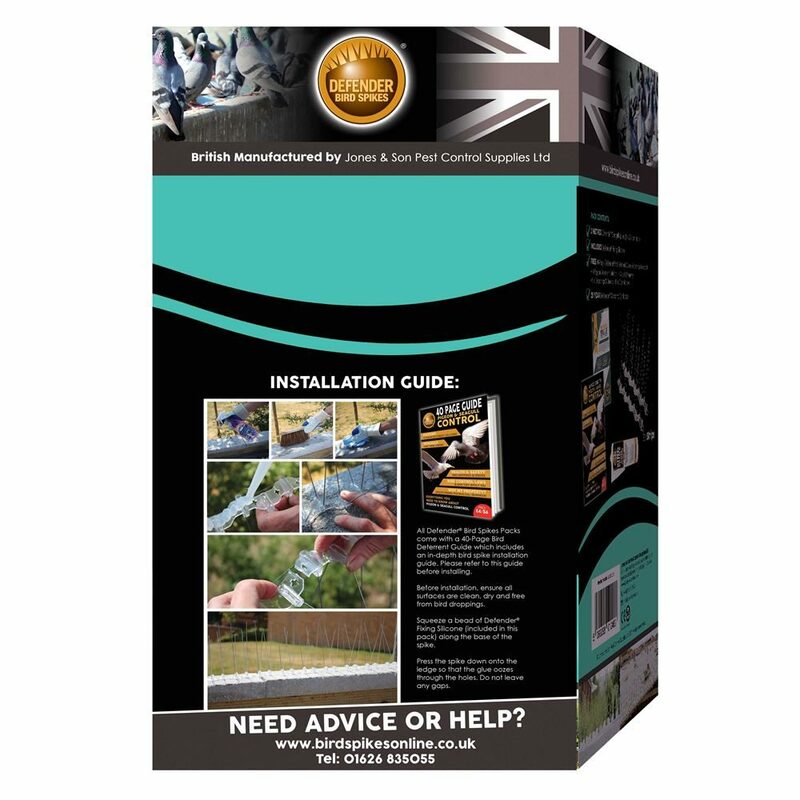 The packaging itself has a simple installation guide showing how easy it is to protect your property from pigeons. 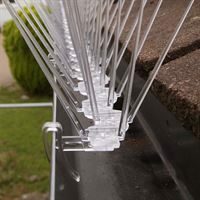 The Defender® Plastic Wide Bird Spikes 3 Metre (10 ft) Pack is a great solution to getting rid of pigeons from wider ledges, fences and window sills. The fan of pins means it can keep a ledge free from birds with a depth of up to 200 mm. 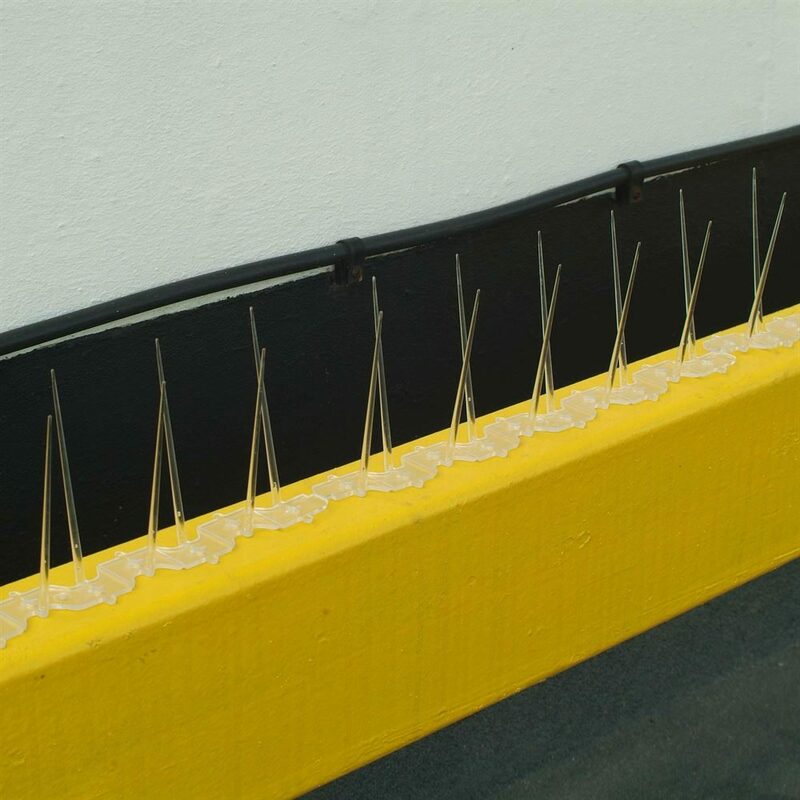 Of course, if the ledge is deeper another row can be added. 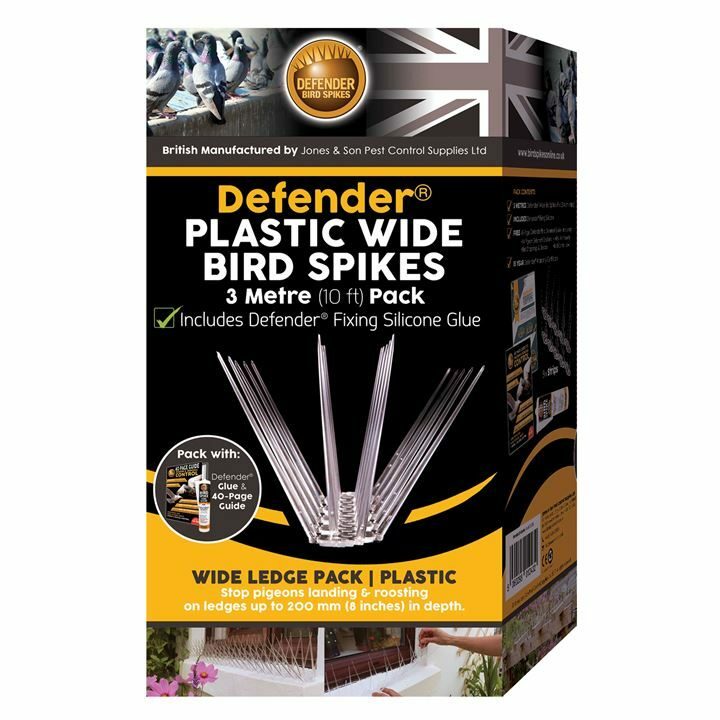 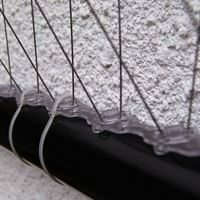 There is enough Defender® Silicone Glue included to install the 3 metres of plastic wide bird spikes. 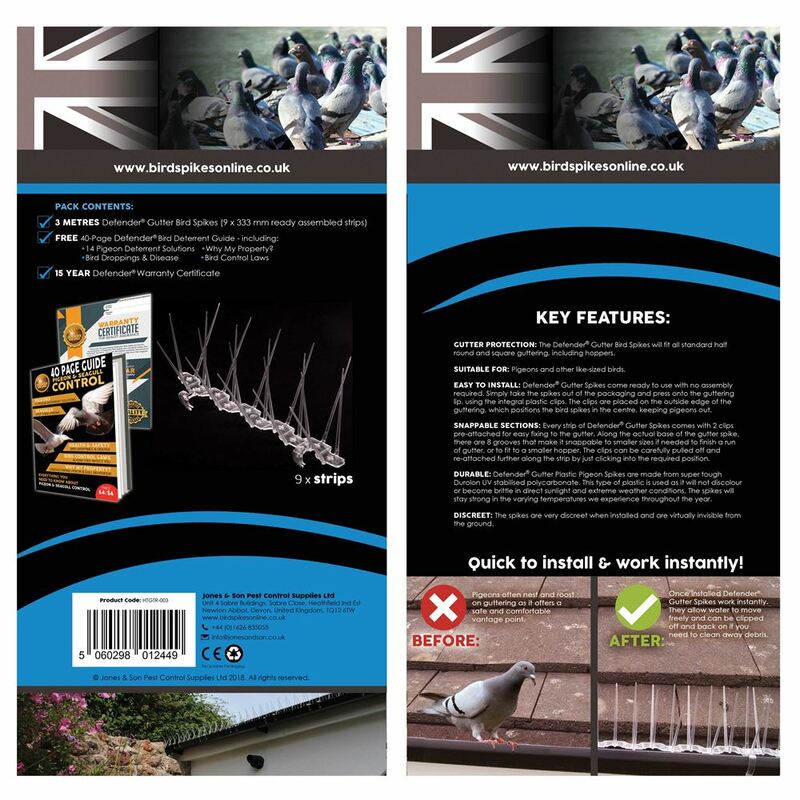 The packaging itself features a simple to understand installation guide specific to the Plastic Wide Bird Spike, complete with clear to follow pictures. 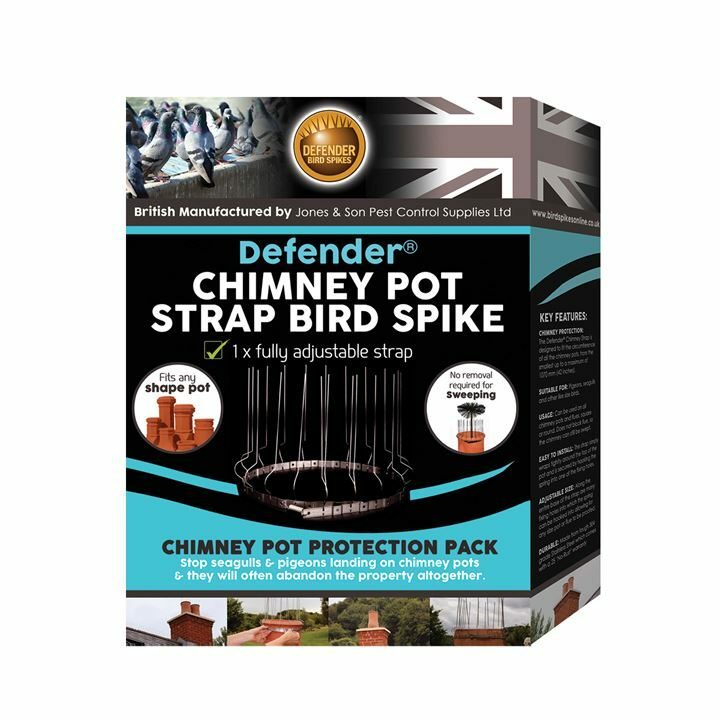 The Defender® Chimney Pot Strap Bird Spike Pack contains one strap which fits all shape and size pots and flues. No other tools are necessary to fit it. 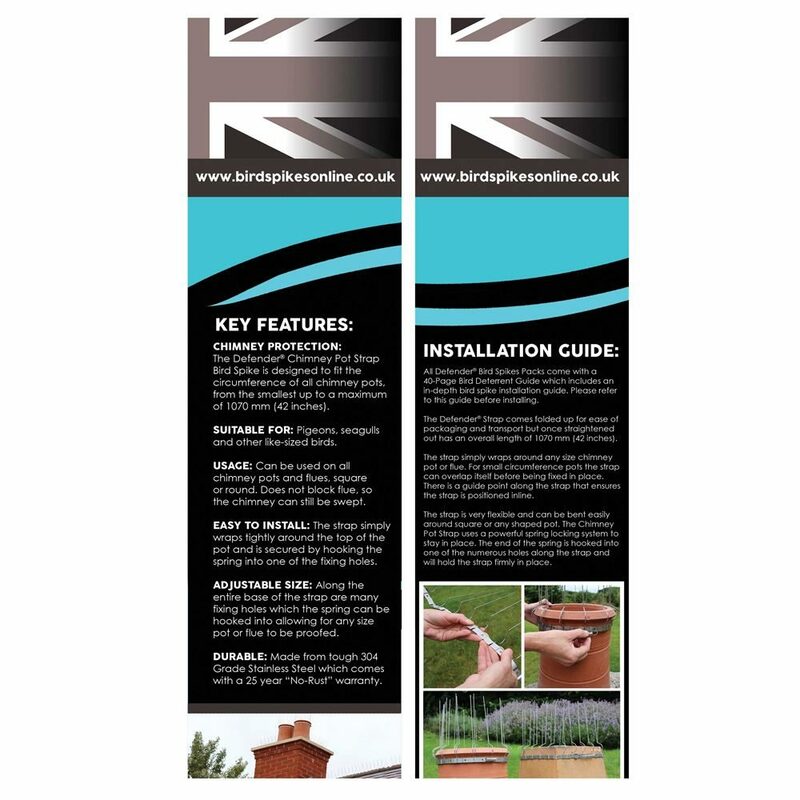 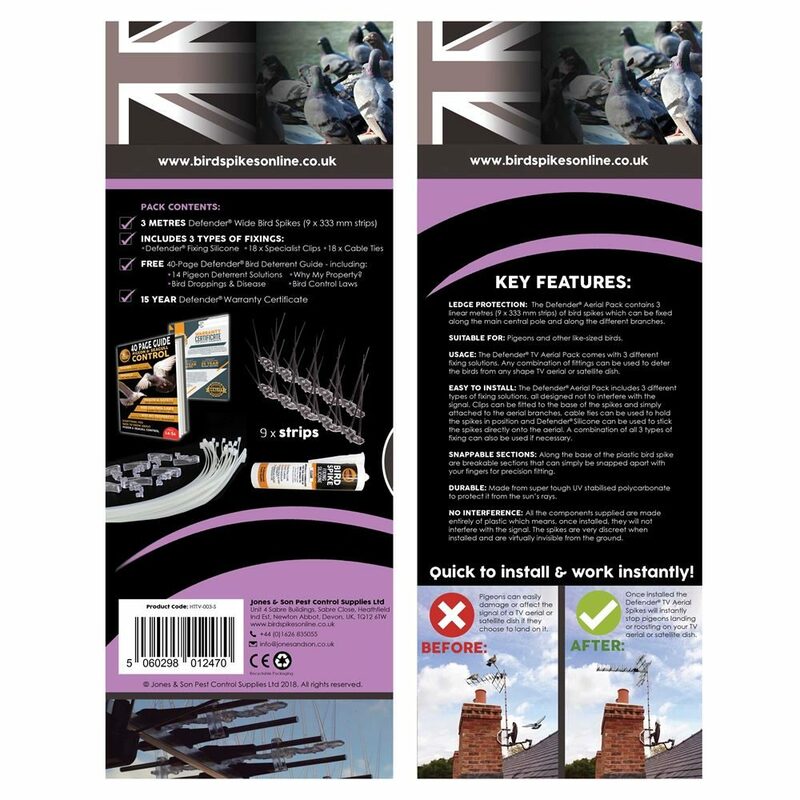 The packaging of this retail pack has a great chimney strap installation guide complete with clear concise pictures showing how it fits snugly around all square and round pots. Inside the pack there is a 40 page guide on bird and pigeon control, this is full of interesting articles, such as birds and the law, health and safety and why my property? 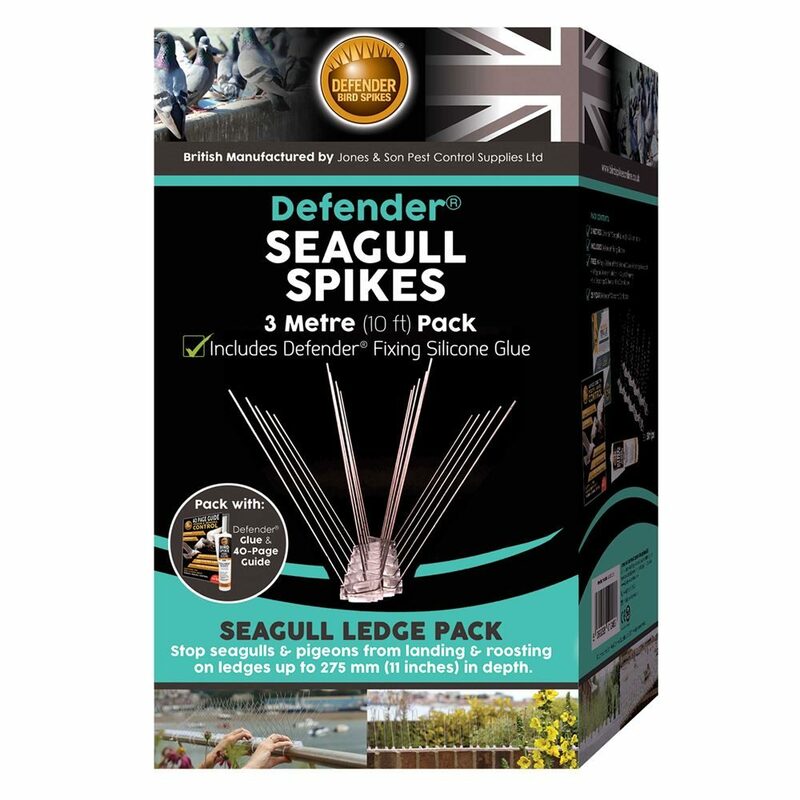 Move seagulls off your property using the Defender® Seagull Spike Pack. Not only does it include 3 metres of gull spikes and enough Defender® Silicone to install the gull spikes, but also a fascinating 40 page guide to seagull and pigeon control. 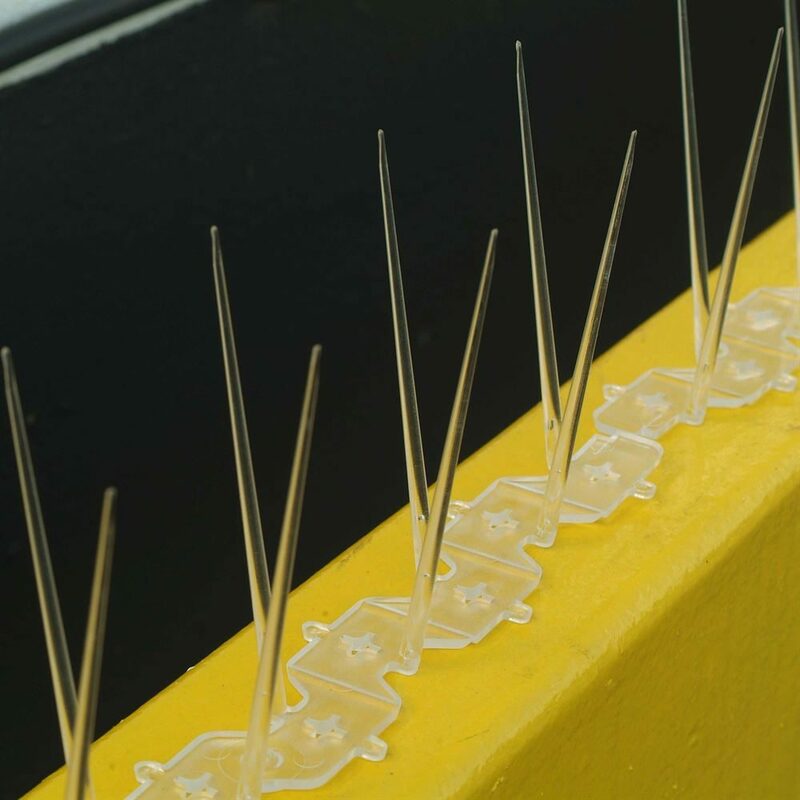 The Defender® Seagull Spike Pack also features a seagull spike specific installation guide, which with the additional photographs, make installation of bird spikes quick and easy. 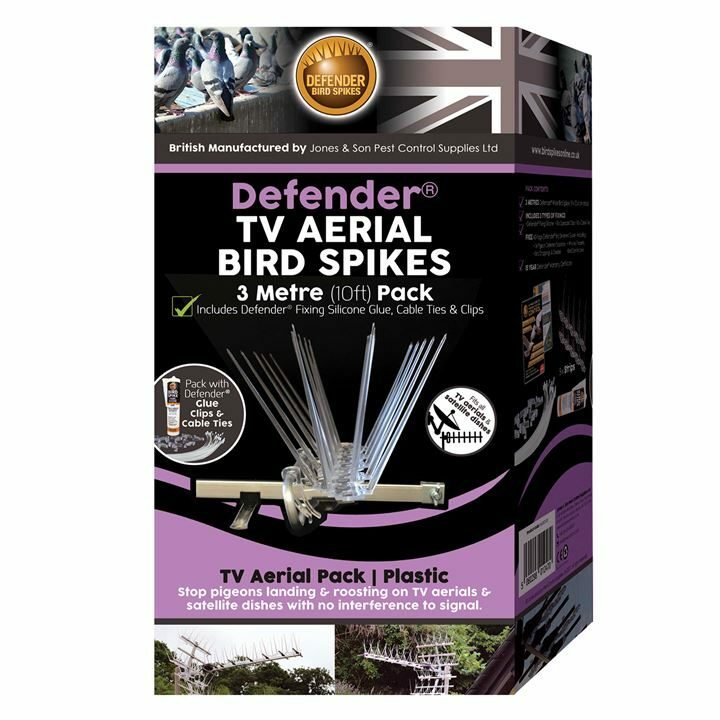 Defender® TV Aerial Bird Spikes Retail Pack contains everything needed to proof your aerial or satellite dish against birds and pigeons. 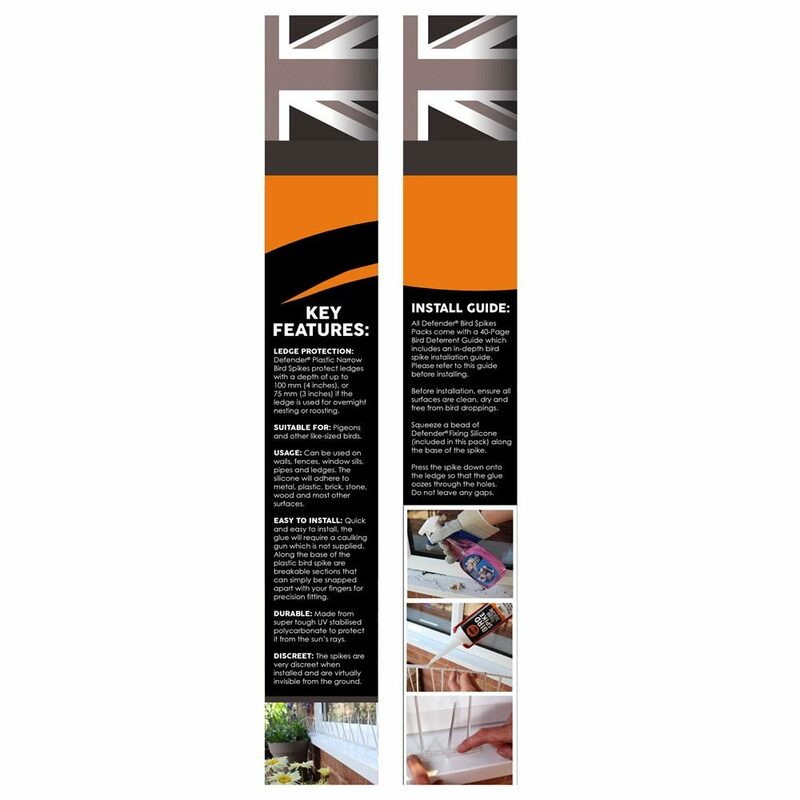 It comes with three different fixings that can be used alone or in conjunction with each other. 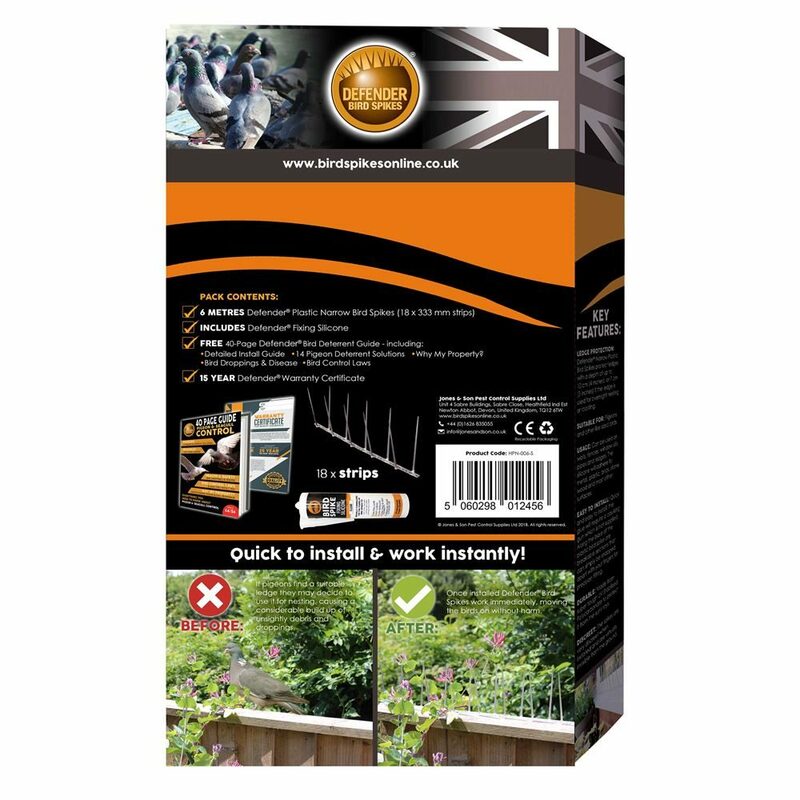 This pack comes with a great 40 page pigeon deterrent guide which contains many interesting articles. 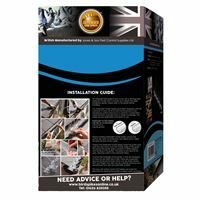 The Defender® TV Aerial packaging features an installation guide which is specific to this product, complete with clear photos of how to install correctly.